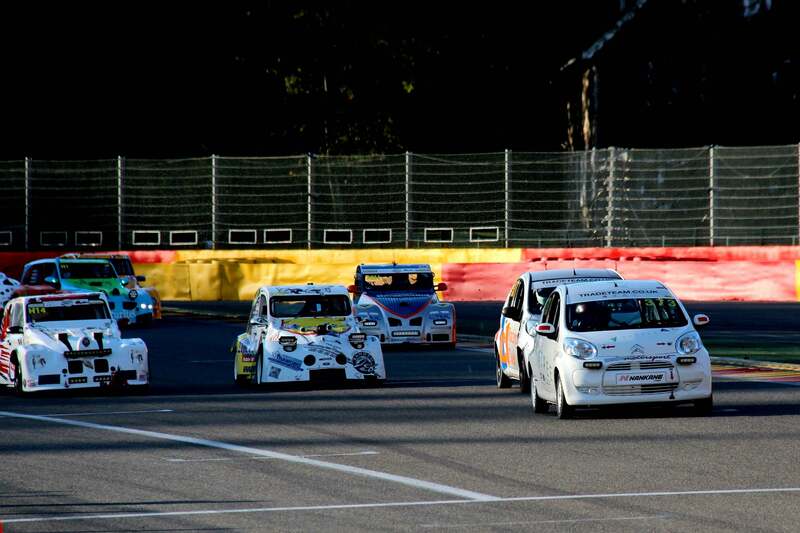 Welcome to Citroen C1 racing, upstart addition to a 24-hour 2CV eventthat’s been a fixture at Spa for over 30 years. They’re still here, their slammed Deux-Chevauxs and Dyanes corrupted by air-cooled, flat-twin BMW bike engines with over 100 horsepower and crazy homebrew bodywork, faired-in wheels and all. 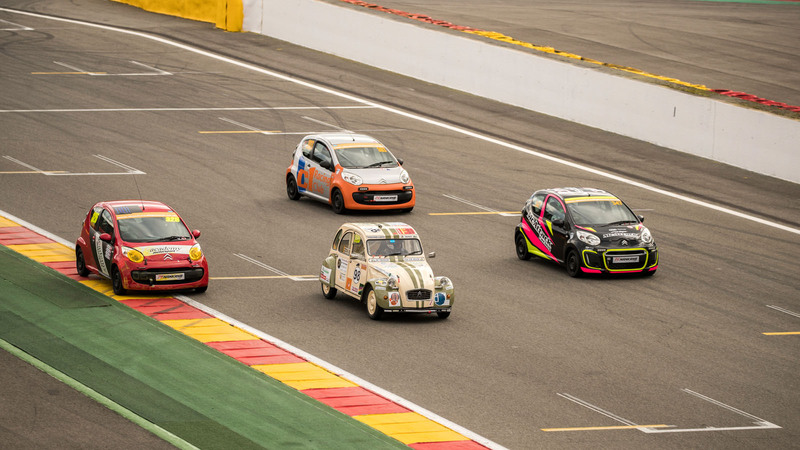 Why on earth would anyone want to race at Spa-Francorchamps in a Citroën C1? 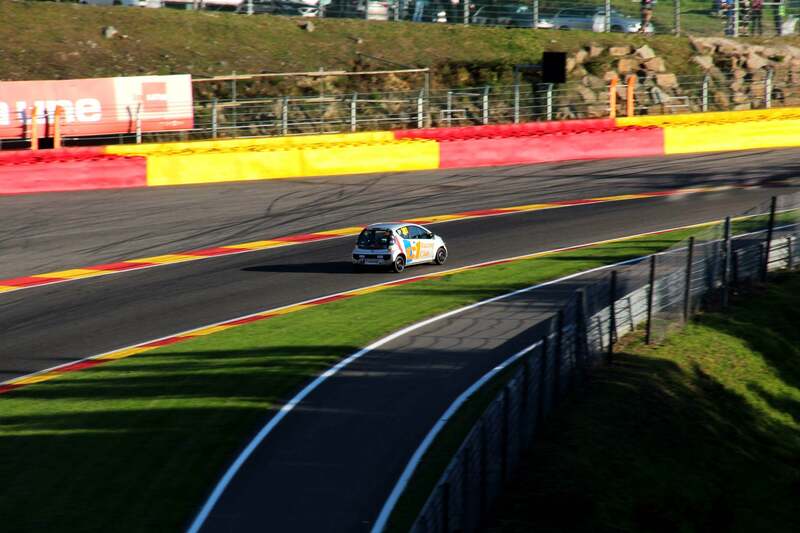 With just 68hp you might think it would struggle to drag itself up from Eau Rouge. And whether it’s Häkkinen on Schumacher back in 2000, Jacky Ickx, Derek Bell and their ilk monstering the track in Porsche 956s in the 80s or Jim Clark and others conquering the infamously fast, road circuit layout in the 60s, Spa has a deservedly fearsome reputation. Close, competitive racing focused on driver skill, not how much money you spend, is the holy grail of any series, whether it’s F1 or the Revival. Because, let’s face it, the races we remember are the ones where the lead swaps places several times each lap and it’s a firm but fair fight between committed drivers on the absolute limit. 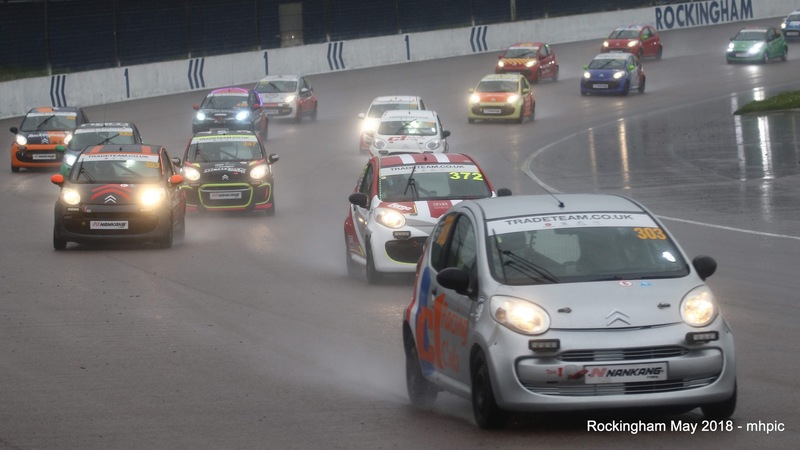 Creating a series where this kind of racing can thrive is a constant battle for organisers. 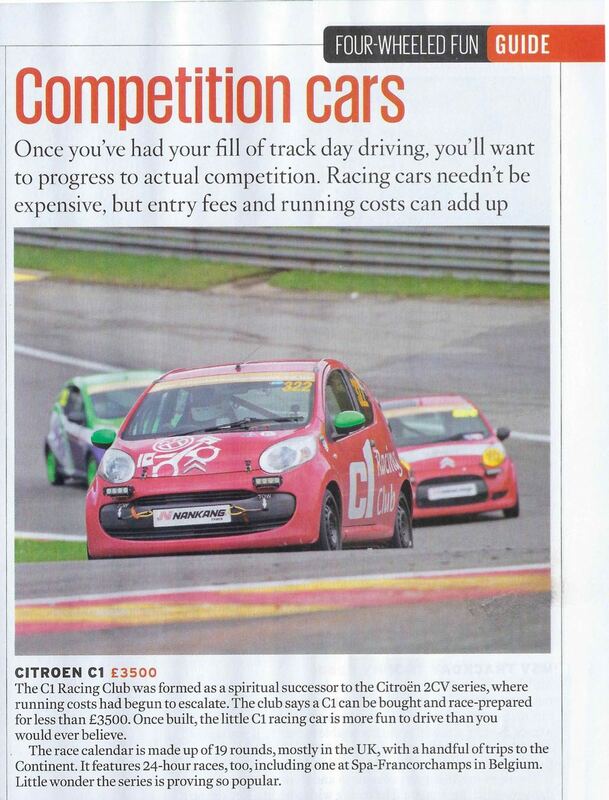 But one the Citroën C1 Racing Club seems to have nailed by basing its championship around a cheap, everyday hatchback you can buy and build into a racing car for very little money. And making absolutely sure everyone plays fair by restricting modifications to an absolute minimum and controlling the supply of packages and parts that transform cheap, dependable city cars into a machine that can race for 24 hours around Spa. 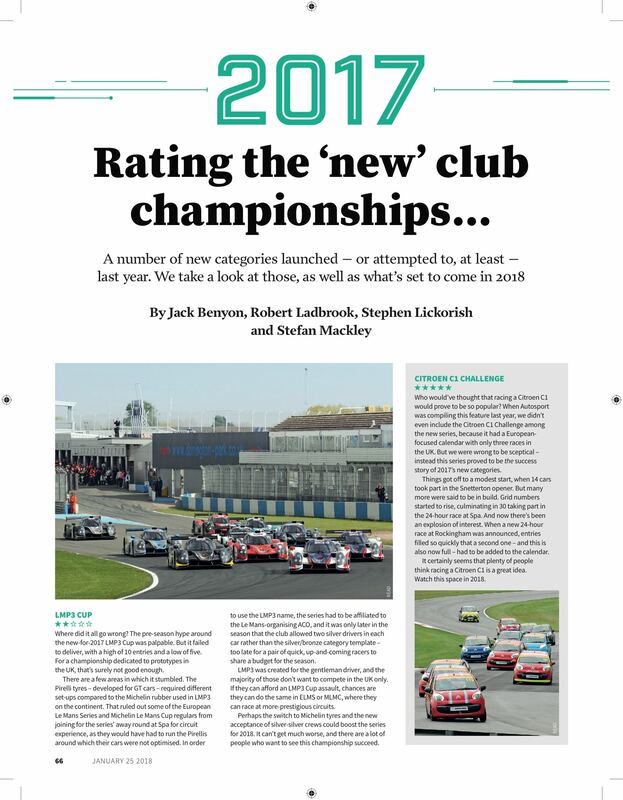 And, while a lowly C1 may not be the most prestigious or fastest competition car ever built, proof that it’s the racing, not the machine that counts is what attracts everyone from gangs of mates on a shoestring to experienced, affluent drivers moonlighting from GT3 and top-flight historic series. 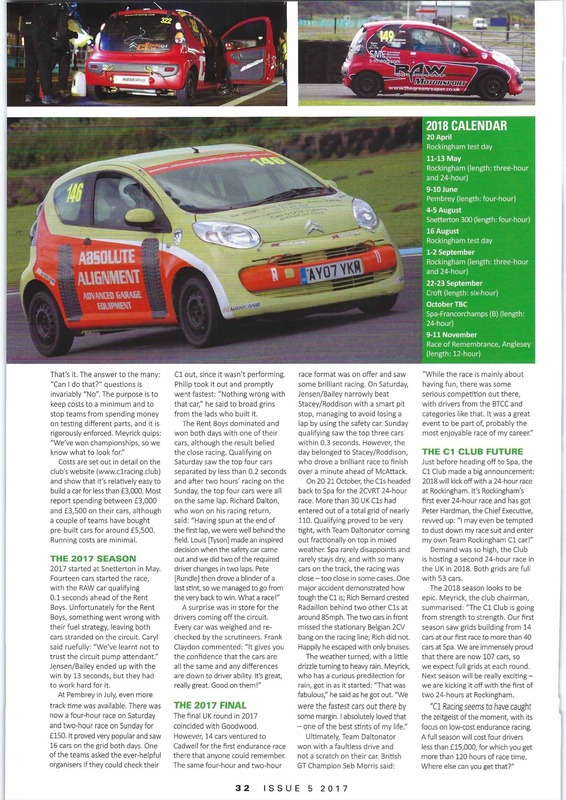 All this becomes clear as I start my first stint as one of four drivers in the C1 Racing Club’s own car. 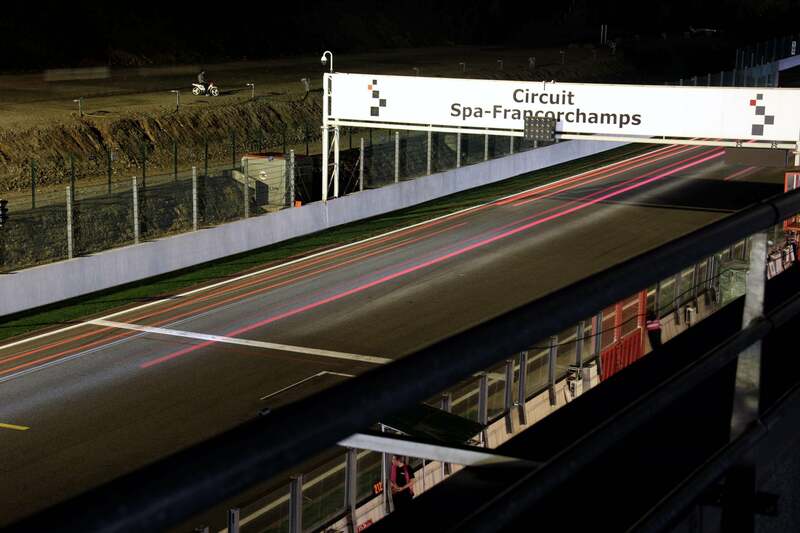 I’ve done about three laps in daylight but, by the time I strap in, Spa is brooding under a silvery, moonlit sky. 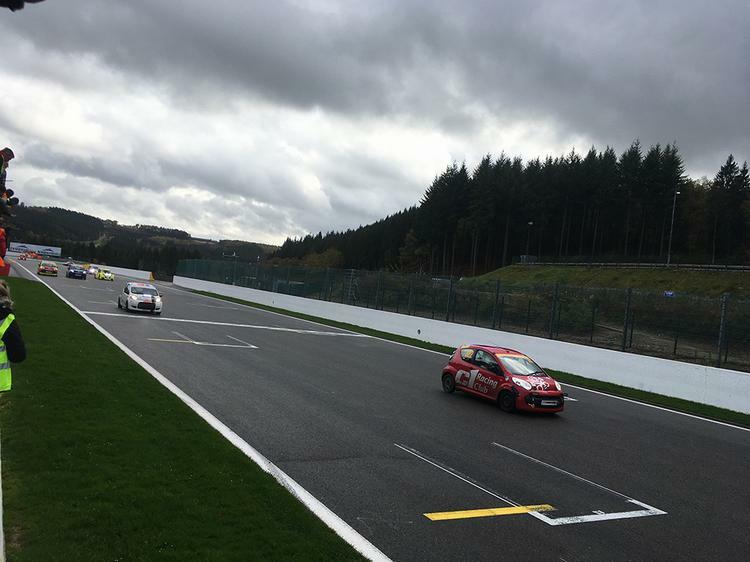 As I merge onto the Kemmel Straight I’m down by about 20mph on the pack of cars who’ve carried their speed through Eau Rouge. And I’m basically trying to keep out of their way until I can pick up momentum on the downhill return. 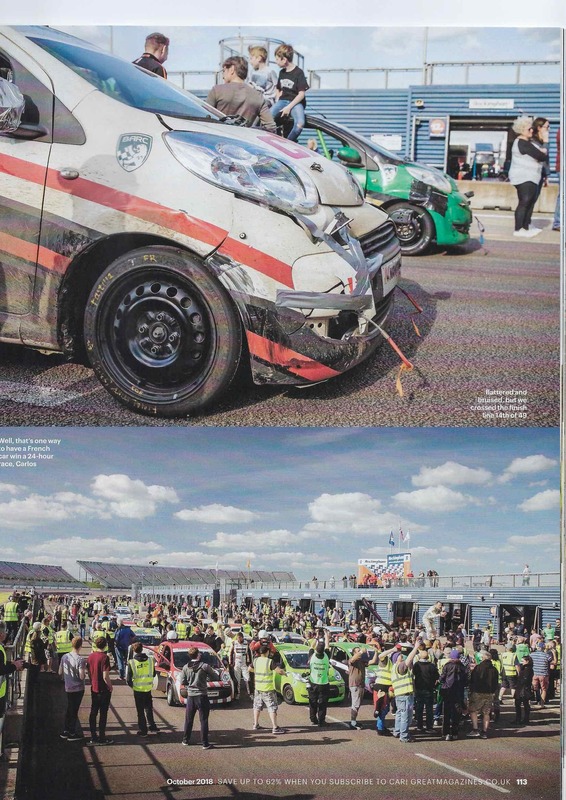 It’s chaos, C1s circulating in packs, locked in private battles, while mad bike-engined, Citroën-based prototypes scythe their way through and everyone dodging the slow-moving regular 2CVs, trundling along gamely at half the pace of everyone else. It’s not unusual to have a pack of a dozen cars of wildly different speeds all converging on one corner, lights dazzling you in the mirrors as you try and second guess whether you’re overtaking or being overtaken. Somehow it works and you get a few seconds to catch breath before you have to do it all again. And, modest power or not, by the time you reach the fearsome downhill left-hander at Pouhon you’ll be doing 90mph-plus and sliding sideways as the budget Nankang tyres start to let go. 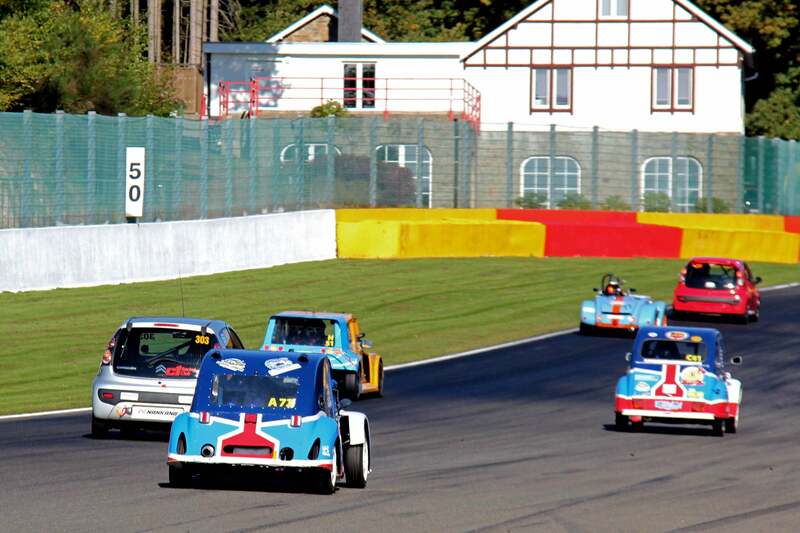 Lap after lap, hour after hour these battles go on, slipstreaming up Kemmel and then ‘doing a Hakkinen’ on some unsuspecting 2CV – a winning technique for gaining a place into the Les Combes chicane. And then it rains. 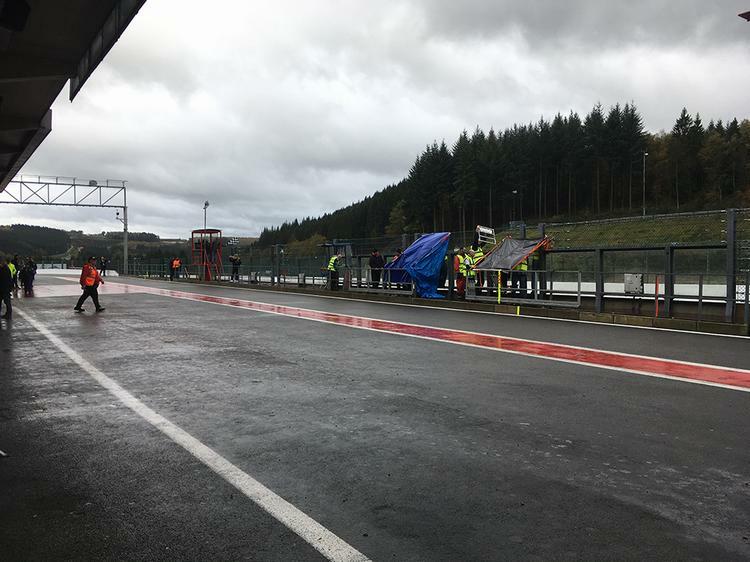 As it always does at Spa’s most exciting races. One thing watching it from the sofa on a Sunday afternoon. Another entirely at 2am when the spray is so bad you can’t see the track surface, your tyres are shot and there are people ricocheting off the barriers in all directions. With nearly 70 C1s on track – two thirds of those from British entrants – and lap times separated by just a few seconds you’re never far from a battle. 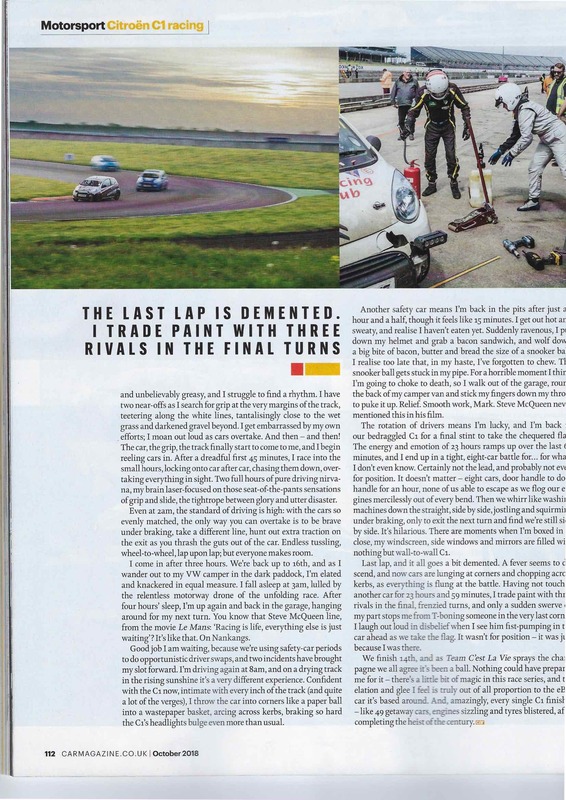 In my second stint I enjoy one that goes on for maybe 10 laps, my rival and I fighting fiercely for every corner but able to exchange a friendly thumbs-up at the shared thrill as we swap places on the straights. And that’s what it’s all about. No quarter given on the circuit and relaxed, ego-free camaraderie in the pits. In a car you could build and enter from scratch for less than £5,000. Pure racing, the like of which attracts high-rolling racers to gangs of mates alike. And levels the playing field in a way few other series have achieved, for a price within reach of nearly anyone. 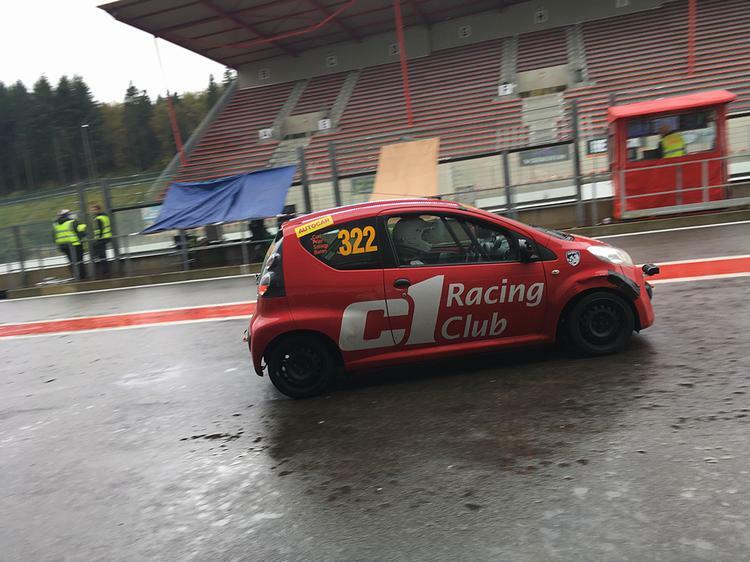 That’s why you’d want to race a C1 round Spa. 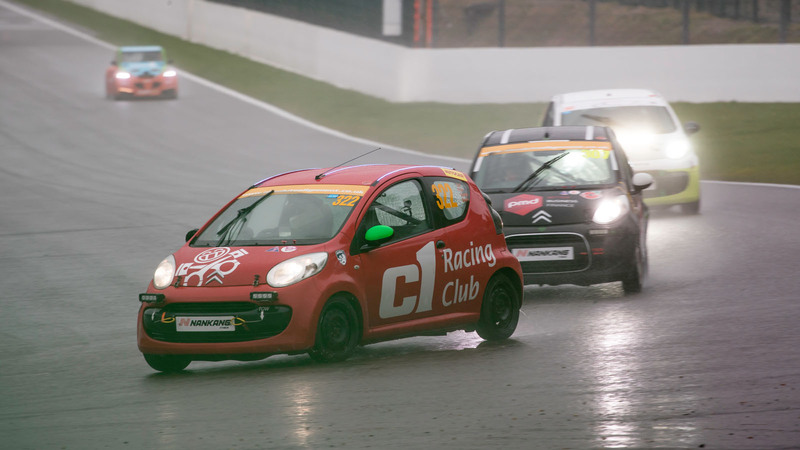 The Citroen C1 Racing Club offers almost comically affordable, yet seriously competitive endurance racing. 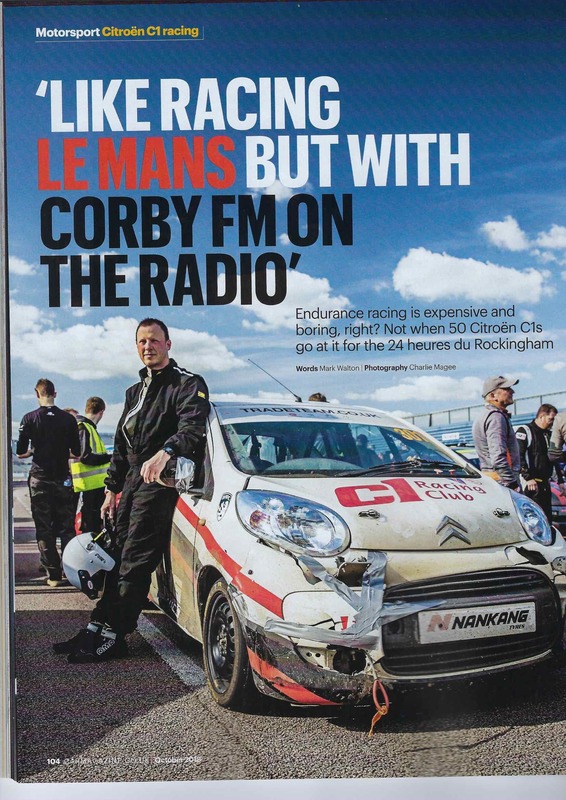 We took part in the Citroen C1 Racing Club’s 24-hour race at Rockingham Speedway, sharing a car with Le Mans legend Anthony Reid. 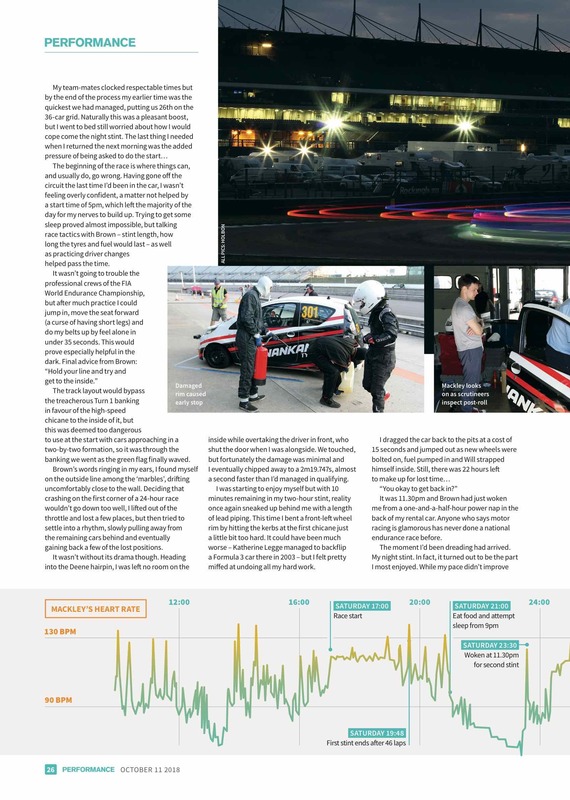 Read on for tips from a pro-racer on how to make the most of your budget racing experience and our story on why this club should be your first stop if you want endurance racing on a shoestring. It’s not entirely representative of all the Citroen C1 Racing Club’s races that you find yourself sharing a car with ex-Le Mans racer Anthony Reid, and a garage with WEC driver Andy Priaulx, Seb Priaulx (Andy’s son), Alan Gow and Richard Solomons – all significant names on the racing scene. 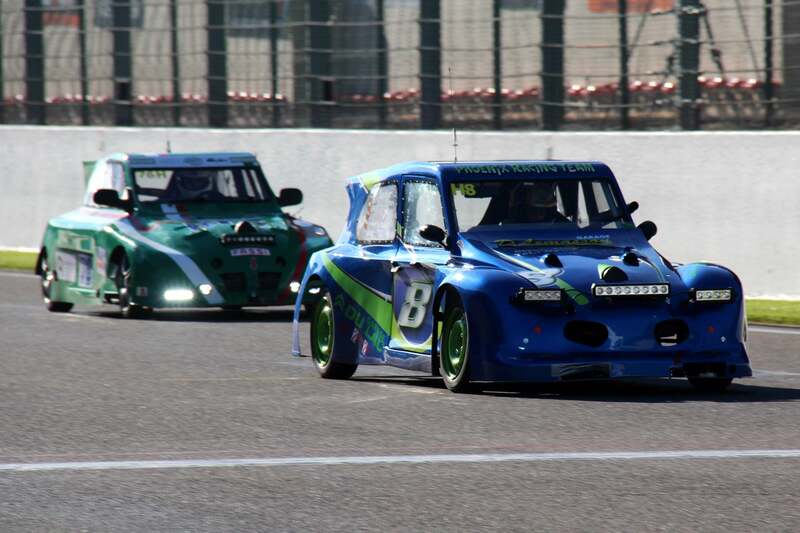 An odd one-off, because the club exists to offer cheap endurance racing. 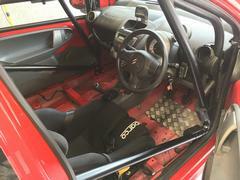 It’s estimated that £12,800 will get you the car, its modifications (which are deliberately minimal and basically involve stripping it out, putting in a roll cage, kill switch and extinguisher, fitting a strut brace and that’s about it) and 107 hours of racing, including a 24-hour race at Spa. Split that between four drivers and it’s £3,200 each. You do have to factor in transport to the races, crash damage and who does the spannering, but any way round it’s crazy how cheap this is. 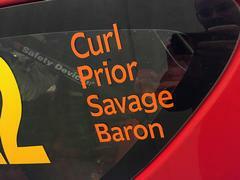 And here’s another thing: While Priaulx and co. in car 303 were a class apart from most others, they didn’t put it on pole and there were others on a similar level. 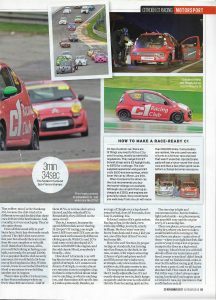 So while the C1 Club’s garages may not often be so star-studded, there’s a rare mix of brilliant drivers you can learn vast amounts from and novice drivers who offer a field of more reassuringly realistic competition, if (as in my case) you come to the C1 Racing Club with little or no race experience. Naturally, Reid and the other pros may not be willing to give up the secrets on how to get the most out of a budget race like this, but I am. 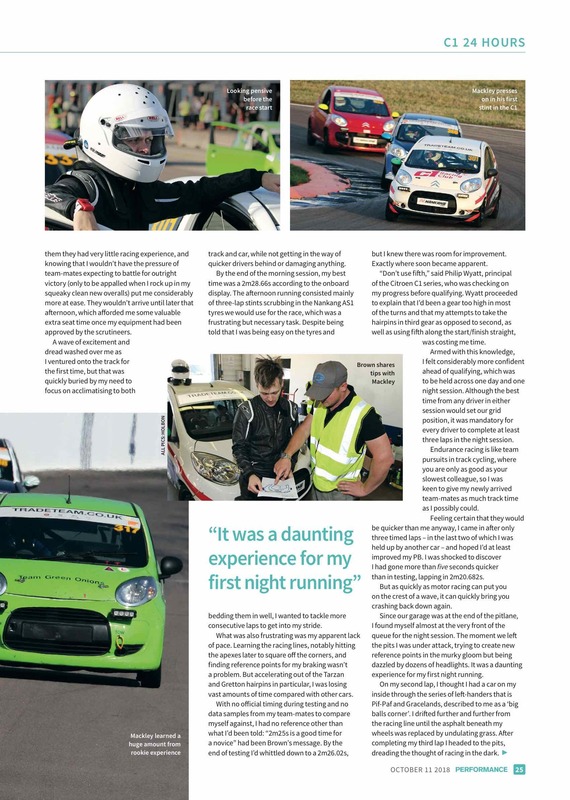 So here’s my story, as someone who knows how to drive a car fast but is – by my own admission – inexperienced at racing and crippled by politeness and fear of causing carnage when it comes to overtaking. 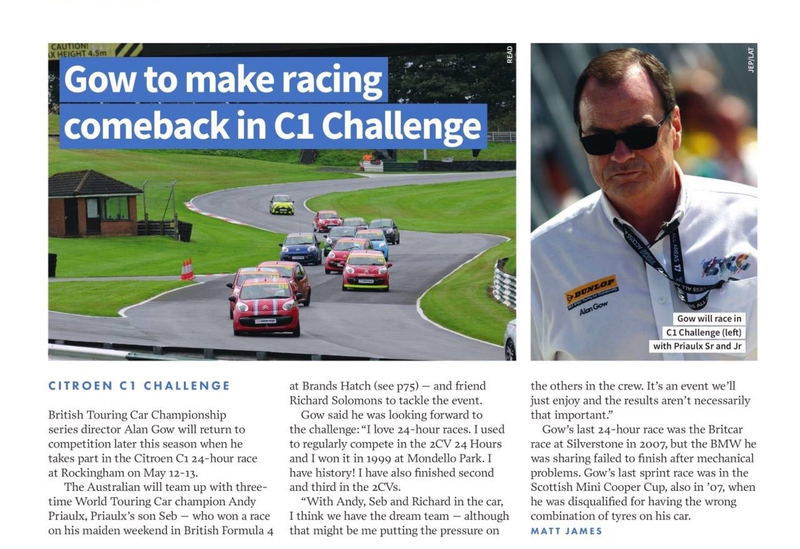 And also read on for tips straight from the racing legends on how to save time and have the best possible race if you’re planning on having a go at cheap racing yourself. That’s a John Surtees quote and one that Reid lives by. With quite some fervour. 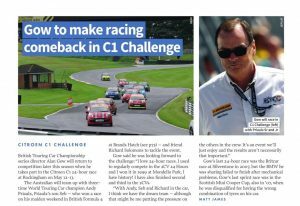 He might be quietly spoken, impeccably polite and about the nicest bloke you could meet, but there’s also an obsessive, burning competitiveness that characterises everything he does over the race weekend at Rockingham. 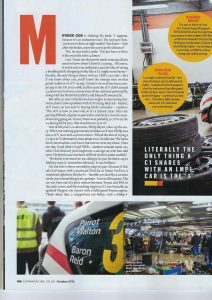 Sure, this is grass roots motorsport, but he wants to win just as much as he did when he came third with Porsche at Le Mans in 1990. The first thing he did was elasticate the seatbelts – using the basic, stretchy white elastic normally found in camping shops, he tied the harness to the cage, so that the belt jumped back out of the way when it was undone. It saves precious seconds during driver changes, as you always know where the belts are. I found out just how good this trick is as I threw myself, deeply terrified, into the car at about 7.30pm. We were in P7 – the same position we’d qualified in. 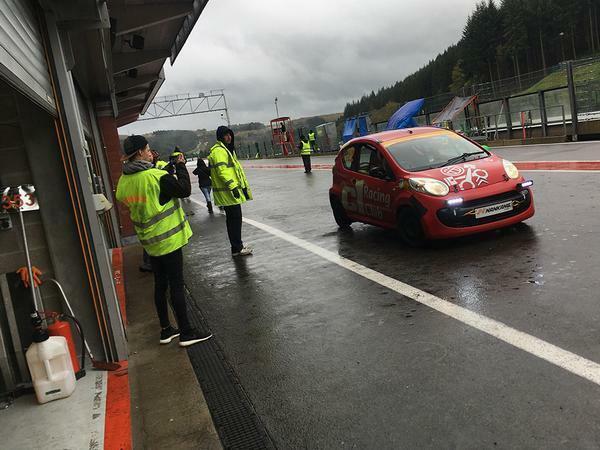 All our testing had happened in dry sunshine and now I was faced with a soaking track, darkness, and a car that had already lost its driver-side mirror. Still, it was a relief how easy it was to get the belts on since we knew exactly where they were… A nifty, cheap free hack to save you time. Remember that one. Another of Reid’s major focuses in testing and the run-up to the race is the tyres. 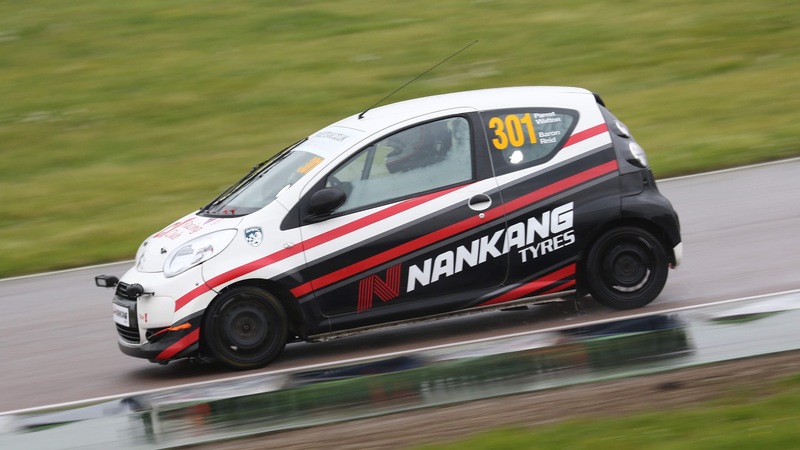 The skinny Nankang tyres cost around £20 a corner, and are of course obligatory in the series. Box-fresh from the factory, they’re then shaved down (still leaving plenty of tread, mind), which makes them rather less grippy. Reid is tireless (if you’ll excuse the pun) in figuring out the best pressures and how worn they should be in order to achieve the best times. 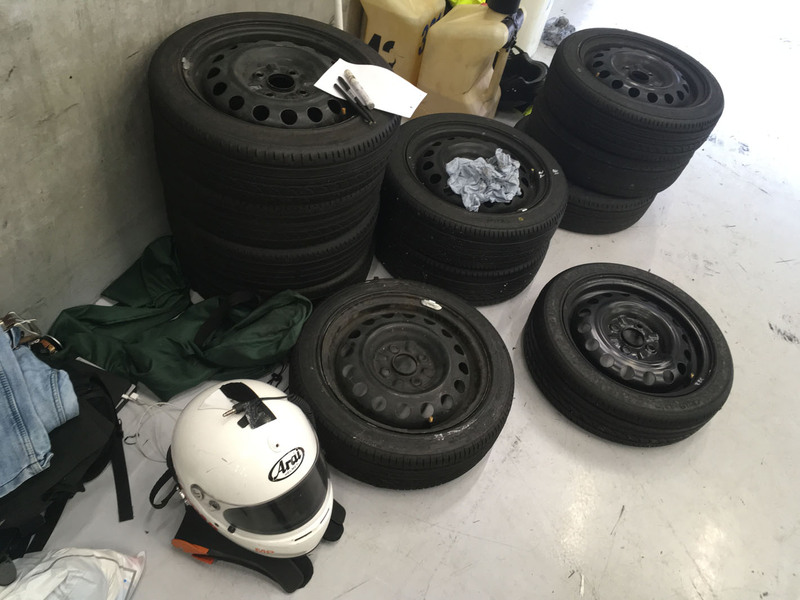 We make sure that all of the tyres are scrubbed with a few progressively harder laps so that they are race-ready but honestly, the monsoon weather makes much of that redundant. Taking over the car at the end of a safety car stint, I was immediately launched into a field of 52 cars all bunched together into a crocodile. 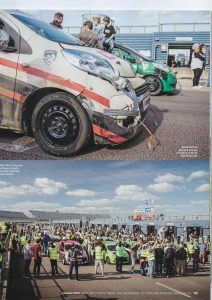 The club is stringent on its driver standards and it has thrown out drivers for executing unsafe manoevres, so the racing is – while utterly hectic – also quite clean. 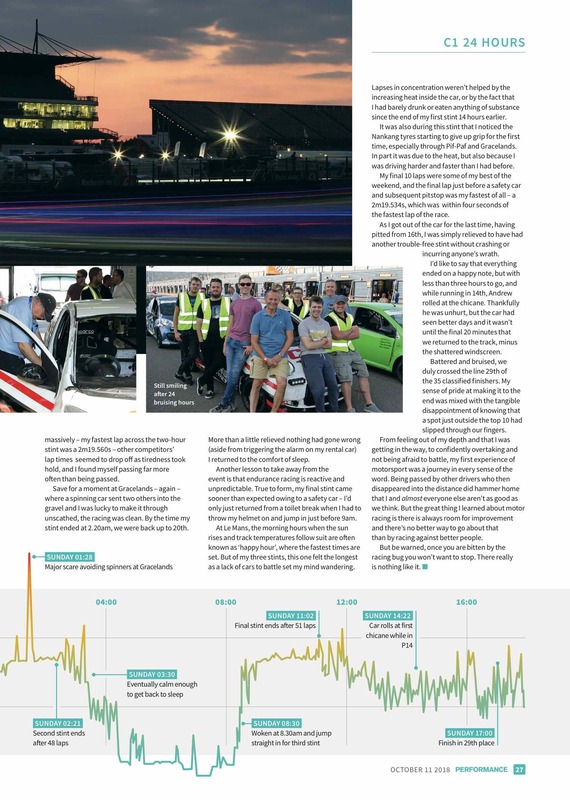 I managed some adequate times but I exited the car after two hours – when a safety car came out again – feeling wrung out and uncertain whether endurance racing was really for me. If it’s this hard in a 68bhp, front-wheel-drive shopping trolley, I couldn’t help but spare a thought for those who were currently pedalling much, much hairier machinery around a wet Nürburgring at the same time. Fun? Hmm. Maybe. It was time for teammate Jason Barron to take over. The Friday before the race, Reid had noticed that the fuel nozzles – a plastic affair that screw onto the jerry cans – were painfully slow and varied dramatically in effectiveness. 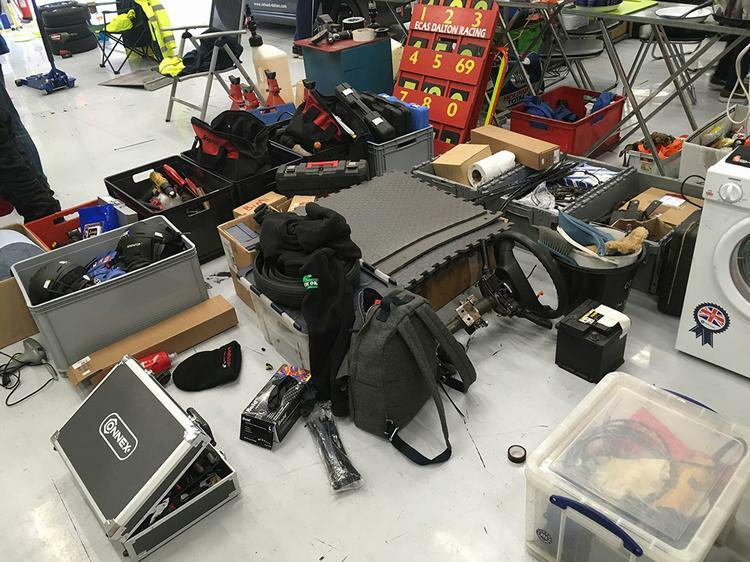 So he started testing all of them, with the help of the truly brilliant pit crew (check out XDR Motors in Salisbury if you need a good mechanic or race support). Remarkably, the best nozzle was more than a minute faster at decanting the full jerry can into the car’s fuel tank. How much intense driving would it take to save that much time, for a trick that most of us wouldn’t have thought of? Sure enough, the fast nozzles were marked up and quietly reserved for our car, although strangely we ended up sharing them with the Priaulx car some 10 hours later… Still, even Reid’s perceptive race prep didn’t save us enough time to make up for my less-than-ballsy racing, so when Barron steered 301 into the night just before 10pm, we were down in 16th. I’m down for the dawn stint, so it’s time for a nap. While I sleep for a couple of hours, 301 is involved in a mild shunt and ends up with much of its front bumper being held on with duct tape. We write it down to a bit of weight saving, but being recovered from the gravel costs three laps and lots of time, so we’re down in 32nd by the time I creep back into the garage at around 2am. Journalist Mark Walton does an ace job of climbing up the ranks during his stint, as the rain eases off and the track begins to dry. Reid’s up next, and I pace, sup coffee and pace a bit more. At some point I have a weird, slightly delirious conversation about exploding penguins, before deciding that what I really need to do is brush my teeth. And drink coffee. And more water, lots of water. Finally I’m called forward at around 5am. 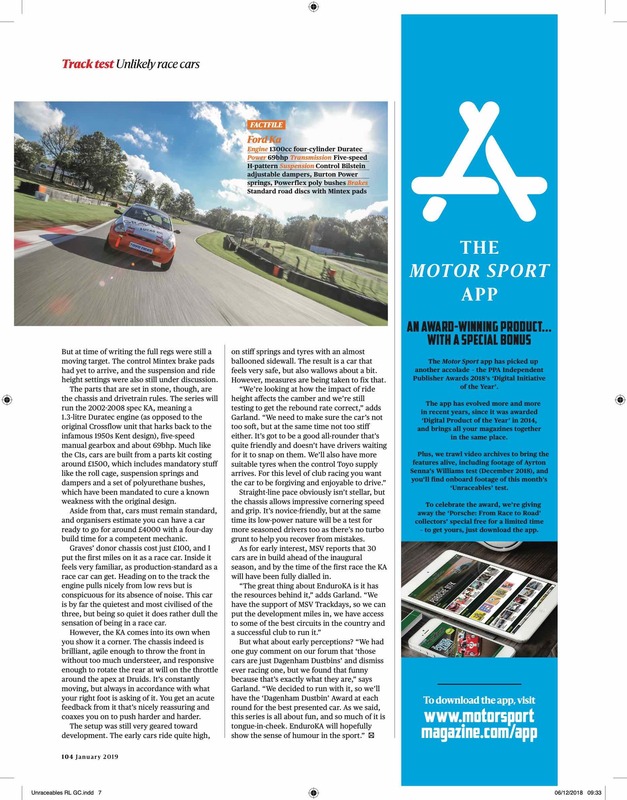 Reid comes in under the safety car, and I’m back out on Rockingham’s International Super Sports Car circuit, heading towards the tight left-hand hairpin that swings you off the speed bowl and into the twisty inner circuit. There’s a clear dry line appearing, so I stick to it and find loads of grip. With that and the first tint of dawn in the sky, I’m immediately more confident than before and start to gain on cars ahead. Car 301 feels good, turning in well as I trail-brake in. While I still find myself in tight, aggressive packs of cars, I’m confident enough to fight back and hold my own. 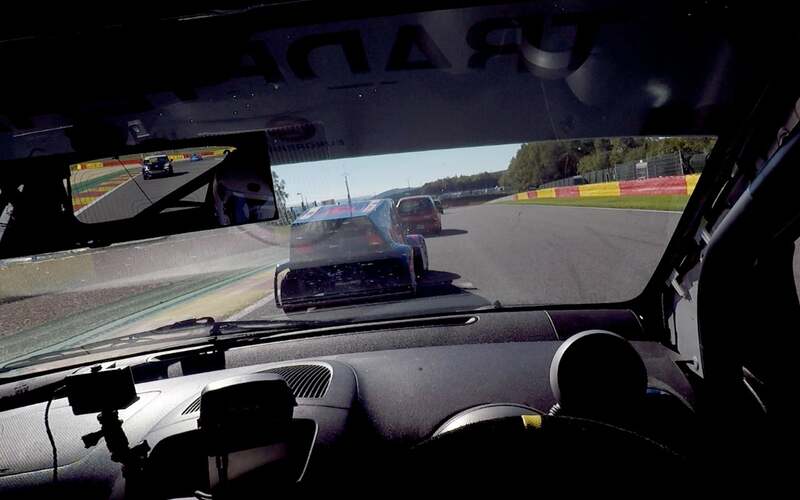 In fact, with each lap I feel the racing tunnel vision creeping in. There’s a great overtaking spot if you dive up the inside of Deene – the hairpin running off the bowl. Another if you take a tight line through Gracelands, a fast left-hander that needs just a lift off the throttle to settle the car before you swing in. Maybe I can get down to a 1:54 rather than the 1:55s that have been my best so far – around three seconds off the fastest times posted. Next thing I know there’s a car spinning across the bowl in front of me as I’m flat-out in fourth with the car loaded up. 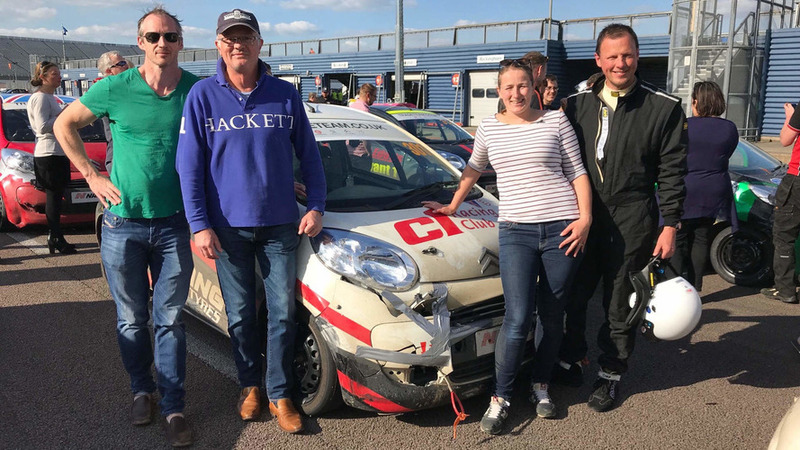 I think it’s going to be The End, but somehow – mostly by clenching hard and trying to stay smooth on the brakes and steering – we make it through the melee to live another lap. The safety car comes out, I check the clock and find I’ve done some two hours. I want to stay out longer but I’ve honestly no clue how much longer the fuel will last and it saves time doing driver changes under the safety car, so I dive into the pits already wanting to head back out again. Cue more sitting around the pits, and eventually I manage to sleep a bit. At some point I ask Reid about why some cars flash their lights aggressively behind you, since I had come out of one such (granted rather rare) altercation only to be miffed to find it wasn’t even a front-runner as I had assumed. ‘It’s just intimidation tactics. Ignore them,’ was the answer. So there you have another gem. 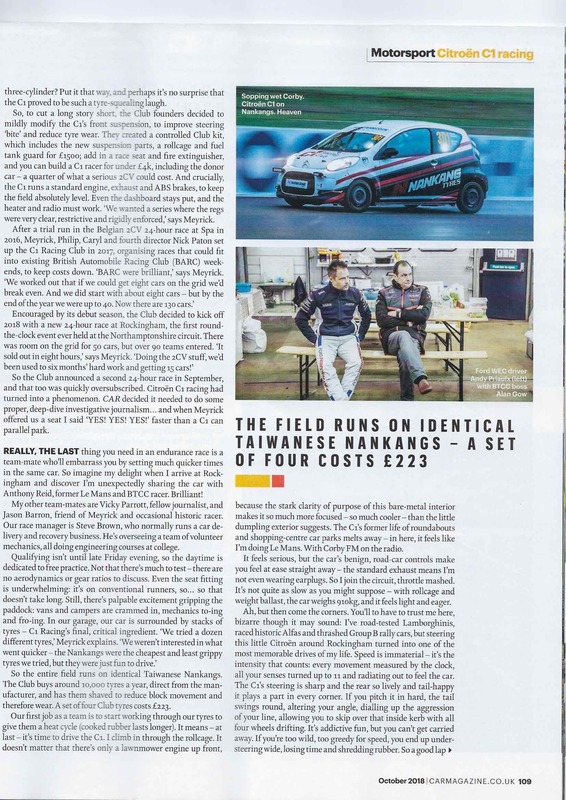 Of course in endurance racing there’s the difficulty of having cars that are laps ahead or indeed laps behind, but the really fast blokes are notable because they never employ those tactics – they just go round you. A touch humiliating, but then learn about their lines and how they make it look so infuriatingly easy by doing your best to keep up. So stick to your line, and don’t dive wildly around to give somebody else space. Well-intentioned as you may be, it makes you erratic and more difficult to get around. And don’t be intimidated if somebody goes flashing their lights at you. Be courteous, be clean, but also be brave and don’t let them ruin your race. 1pm. It’s lunchtime and I’m back in the car, desperate for more time on track. We’ve clawed our way back up to 18th, which is quite impressive. Everything feels good, the track is now totally dry, and I’m gunning for a 1:54. I can hardly believe how much confidence I’ve built in this one race. Confidence has always been my issue when it comes to racing – oddly, I have it in karting but have struggled on the handful of occasions I’ve done ‘proper’ racing of any kind. Yet here I find myself the aggressor on the track. I know I’m faster than plenty of the cars out there and I know where I’m comfortable overtaking. I spend a deliriously brilliant 30 minutes racing with car 399, which is almost exactly matched to my speed around the track. 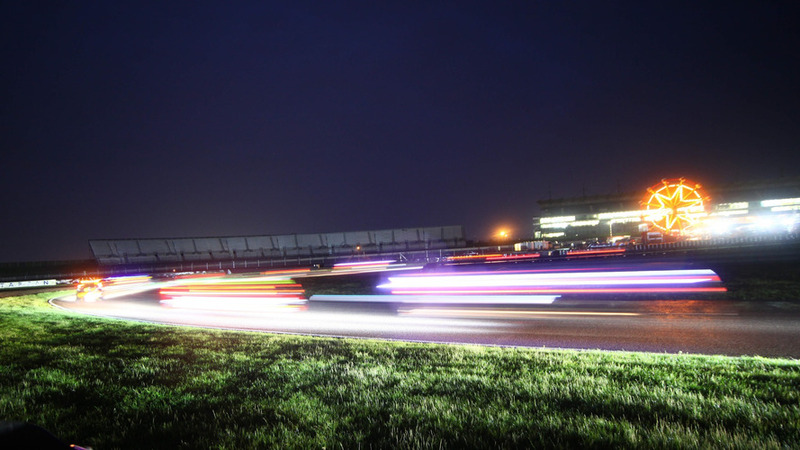 With this circuit taking in a quarter of Rockingham’s speed bowl, drafting is critical, and I get round him that way. Then he gets by me the same way. I open up a bit of a gap. Then I fluff the entry to the bowl and he’s right back on my bumper. So it continues for I have no idea how long, but it is undoubtedly the finest and happiest racing I’ve ever done. I virtually wanted him to win as much as I wanted us to win by the time my stint was drawing to a close. 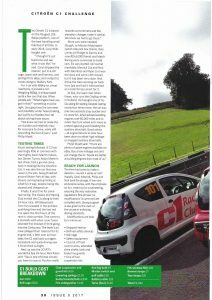 And all the time I’m learning how to go round backmarkers, how best to maintain the C1’s momentum (because these are comically slow cars), how best to keep the lap times down and chip away at the field… It is the most remarkable learning curve and the best fun. Racing can be bitterly, unpleasantly competitive at times. 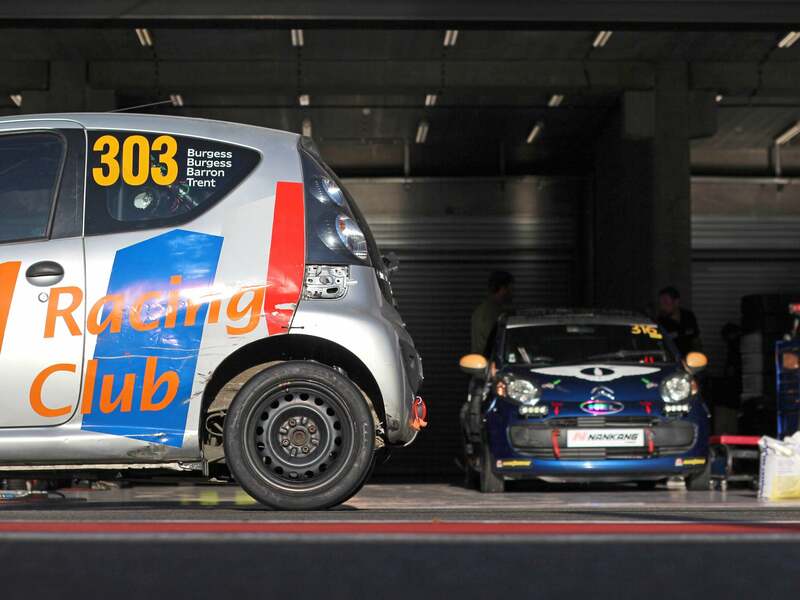 The Citroen C1 Racing Club is not like that – competitive, yes, but also friendly. 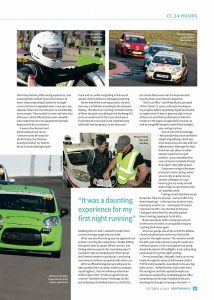 I had someone give me the thumbs up during an overtaking manoeuvre – it’s that kind of experience, plus the car is slow enough to allow you to do that kind of thing. 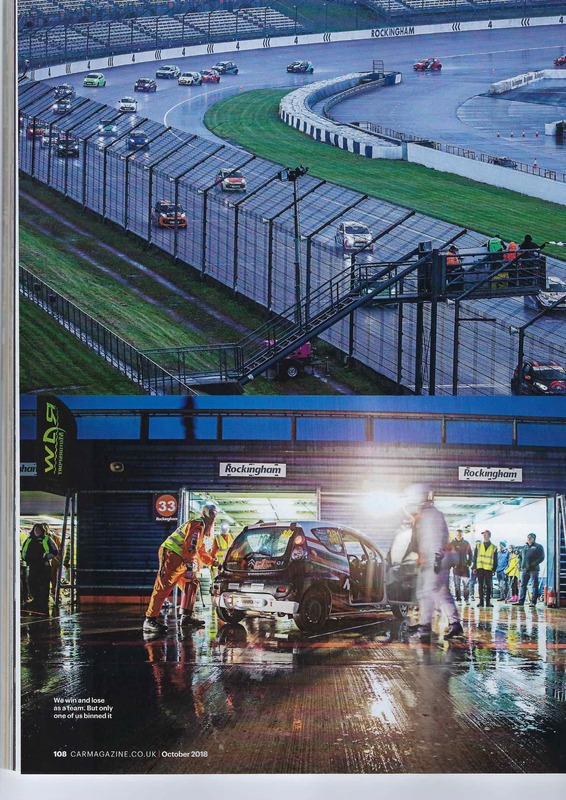 Maybe what sums it up best is what happened at the end of the 24-hour race. 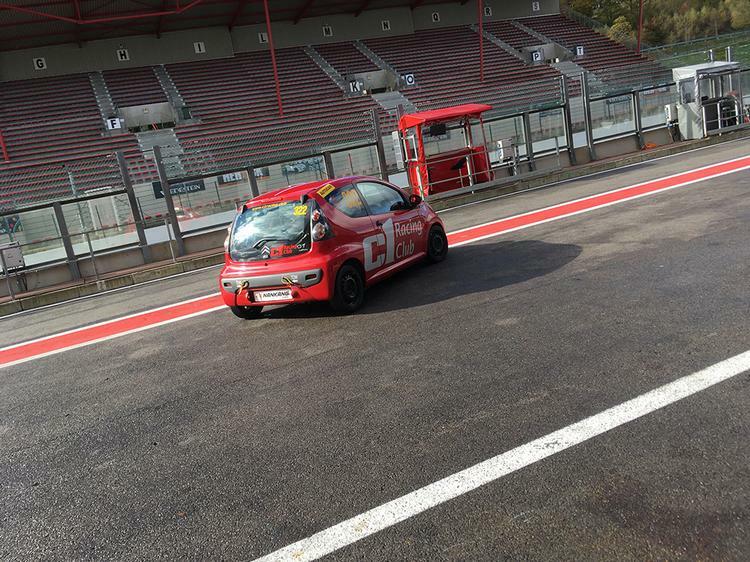 Around five minutes before the end, car 402 ran out of fuel on School Straight – just ahead of the pits. But he hadn’t run out of luck or friends, since car 318 driven by James Poulton – who had been to-ing and fro-ing with car 402 – took pity and slowed down to give 402 a shove into the pits, where he received further shoves from crews of various garages all the way to his own garage. He managed to get back on to the track to finish the race. 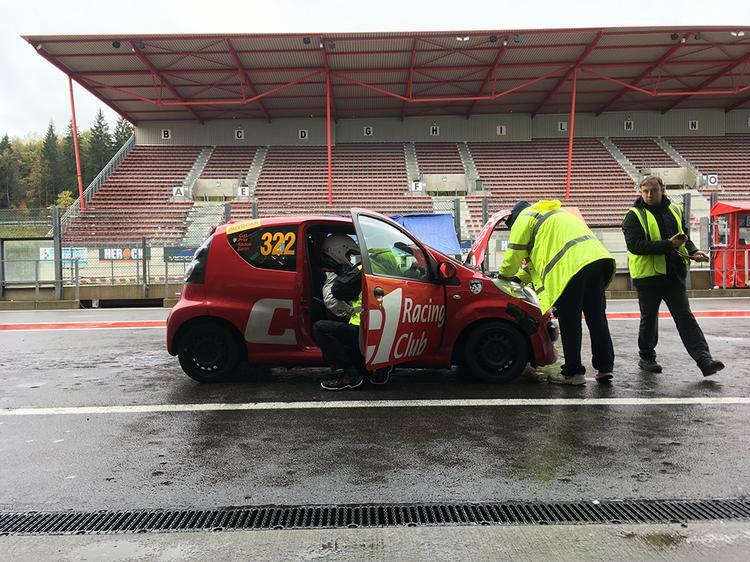 And that’s the sort of stuff that makes the Citroen C1 Racing Club simultaneously a brilliant place for just having fun and also one for seriously working on your racecraft. We finished 14th, which I am heartily chuffed with, especially given how far down we slipped in the middle of the night. Team C’est La Vie in car 349 won the race, and also started on pole, which gives you some idea of how fiendishly rapid the crew of five drivers was. 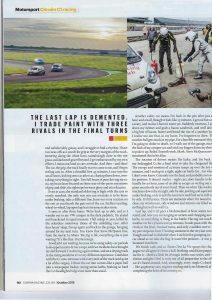 In truth what I took from it was just how perfect this series is if you want to learn to race better – if you want to learn to race full stop. 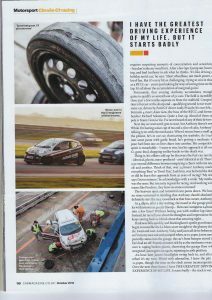 I learned how to take time to judge another driver’s style and lines before overaking, I learned strategy, and I had an absolute ball doing it. 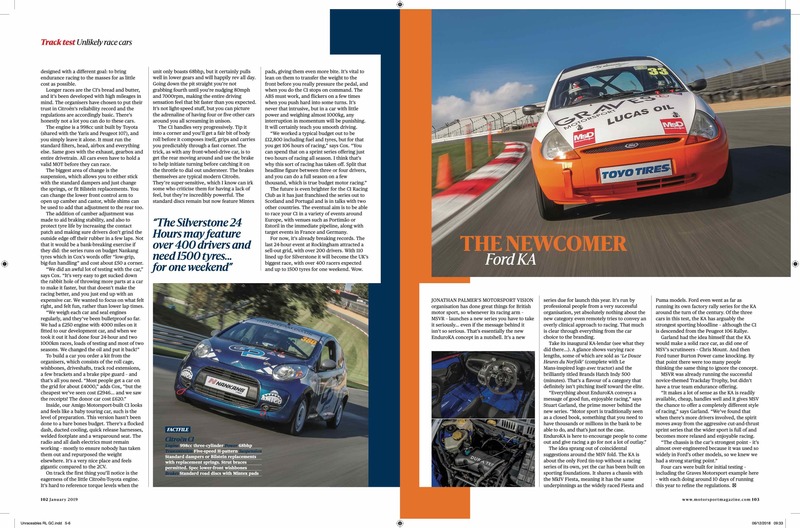 It’s the perfect balance of unintimidating fun in a race car that’s as easy to drive as they come, mated to low costs, a great field of drivers and some brilliant tracks and good company all round. If you want to learn to race, start here. 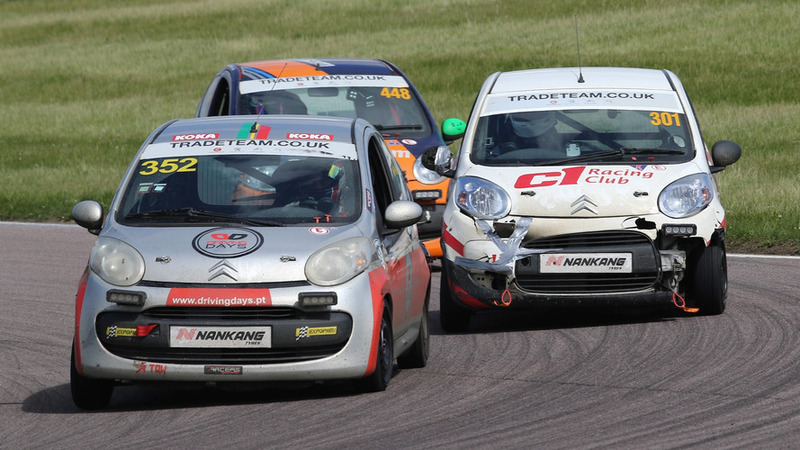 Definitely do some track days or karting first, but whatever you do, get into the Citroen C1 Racing Club because it’s the best fun and the best racing, the best bunch of people and the best tuition you could hope for, regardless of the bargain price. There’s probably nothing more painful than battling for more than 23 hours and 50 minutes, only for your car to stumble at the final hurdle. Just ask Toyota. 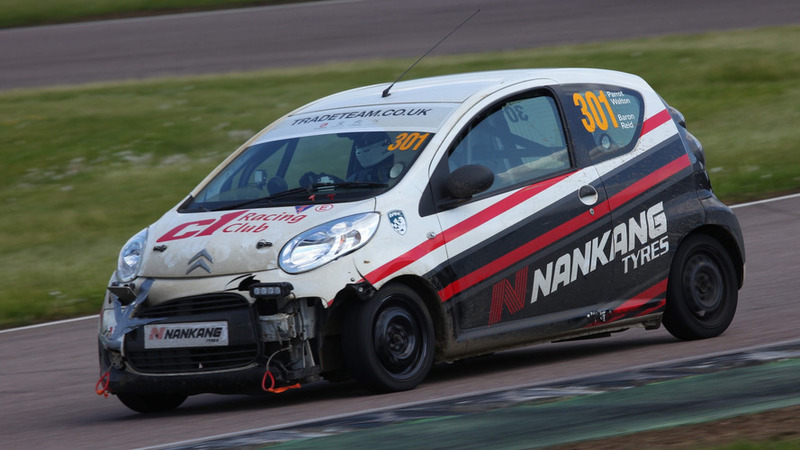 But that’s what happened at this 24 hour Citroën C1 race at Rockingham in May. 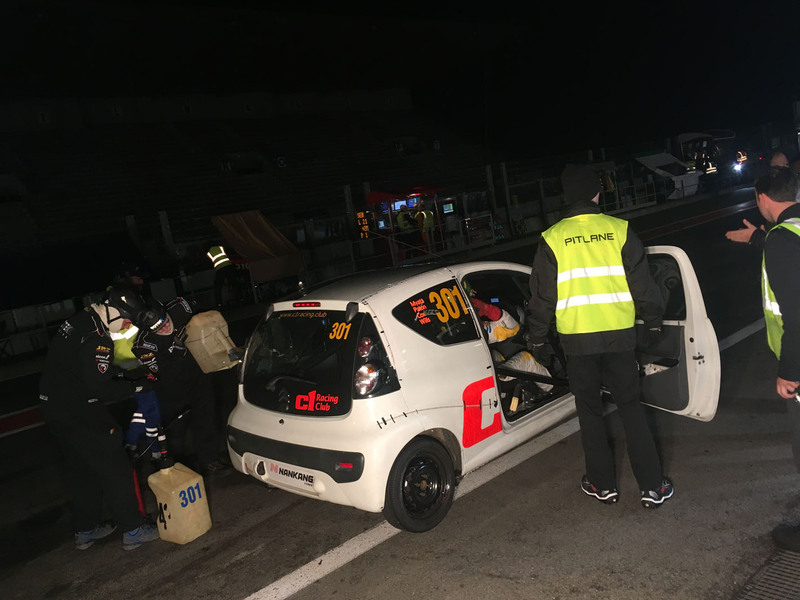 According to the video’s description, car 318 and 402 were battling for eighth place before 402 took the position with 30 minutes remaining. Then, it all went wrong as car No 402 slowed, having run out of fuel 10 minutes from the finish, and just a corner away from the entrance to the pitlane. 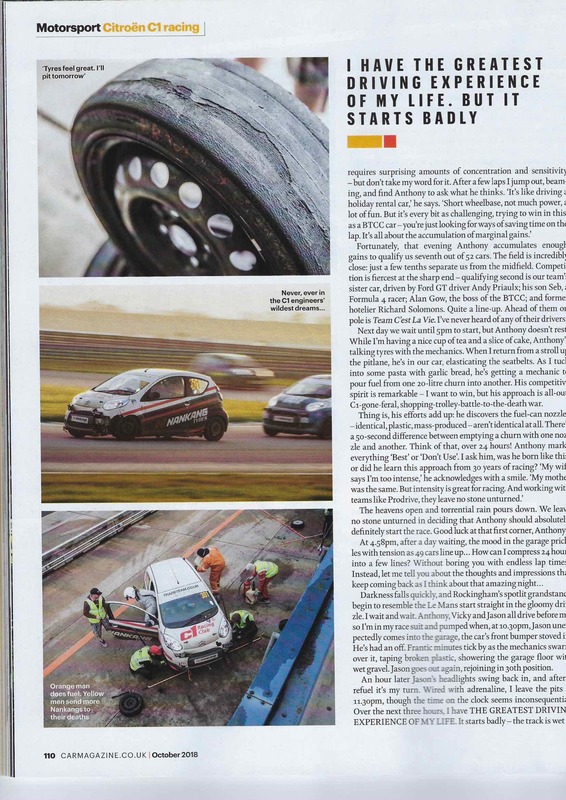 The driver from car 318, in a show of incredible sportsmanship, proceeds to help push his rival’s car into the pits. 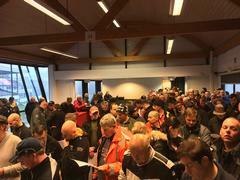 Whilst Le Mans 24hr is a fantastic event with an understandably huge and fanatical following, the cost to buy, enter and run a competitive racing car is very high. 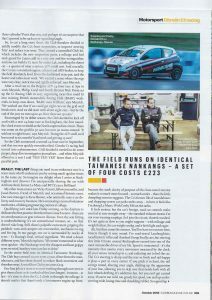 For drivers who are new to the racing scene, or experienced racers who want a low-cost alternative, the C1 Racing Club has quickly gained a reputation for providing extremely fun yet competitive endurance racing on a budget. 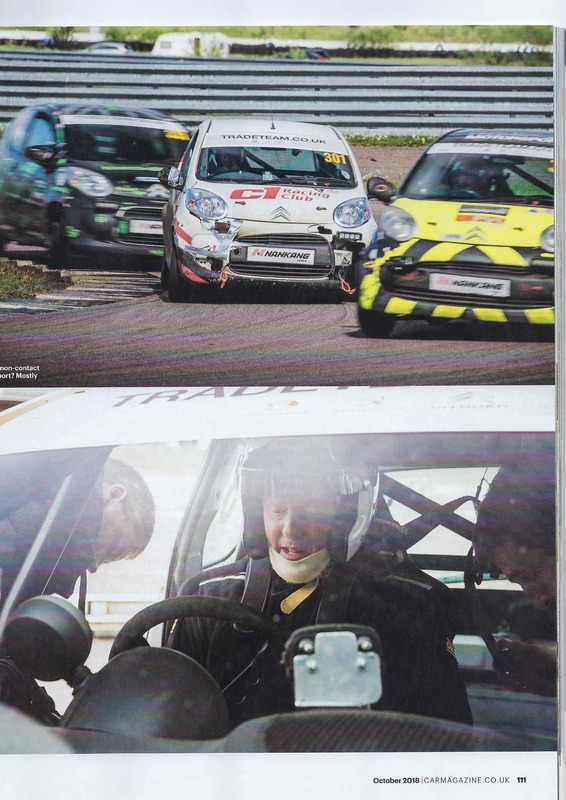 Scott Parkes, Evans Halshaw Citroen Regional Director, is part of the GMP Developments with QSP Motorsport C1 Racing Team, and we caught up with him to find out more about Citroen C1 endurance racing from a driver’s perspective. 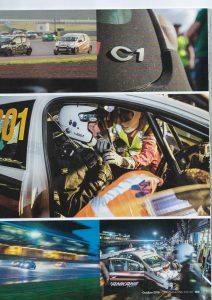 What drew you to C1 Racing? 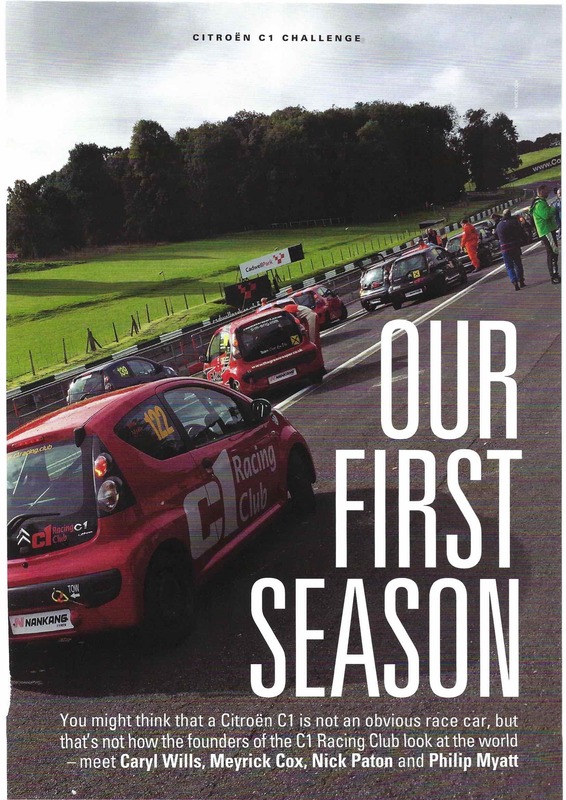 C1 racing is a unique proposition for UK motorsport, it offers the lowest price endurance racing in the UK and with over 50 cars on the grid it is the closest most competitive series outside of Touring cars. How many races have you completed? 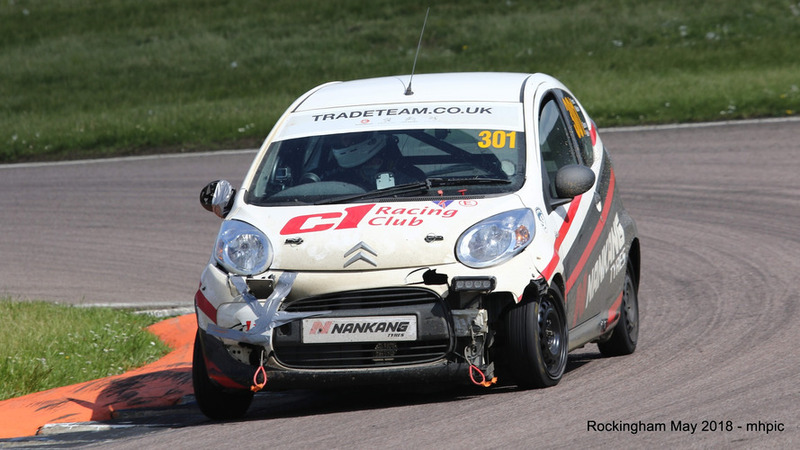 This weekend (Rockingham 3hr, May 12-13 2018) was the team’s first outing in C1 Racing but we have 2-3 cars out at Snetterton 3hr, Rockingham 24hr, Croft 4hr and then the season finale at Spa in Belgium for the international 24hr. 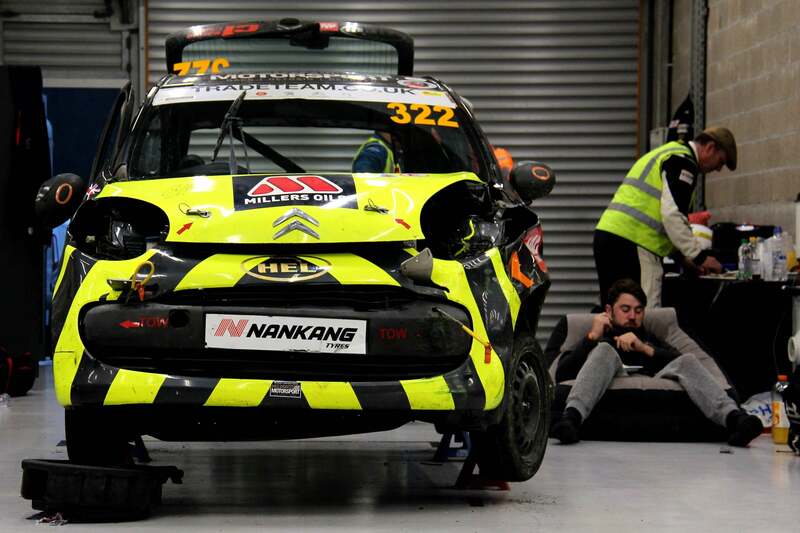 How much does it really cost to buy, enter and run a Citroen C1 racing car? 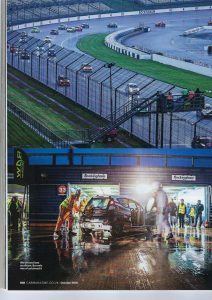 It is costing us on average £4,000 per car to build and entry fees are between £1,500-£3,000 dependent on the circuit and whether it’s a 3, 4 or 24-hour race. 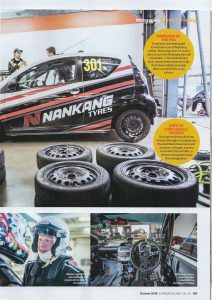 Each race we use between 3 and 8 sets of tyres (which are £150 per set) and we use over £300 of fuel. 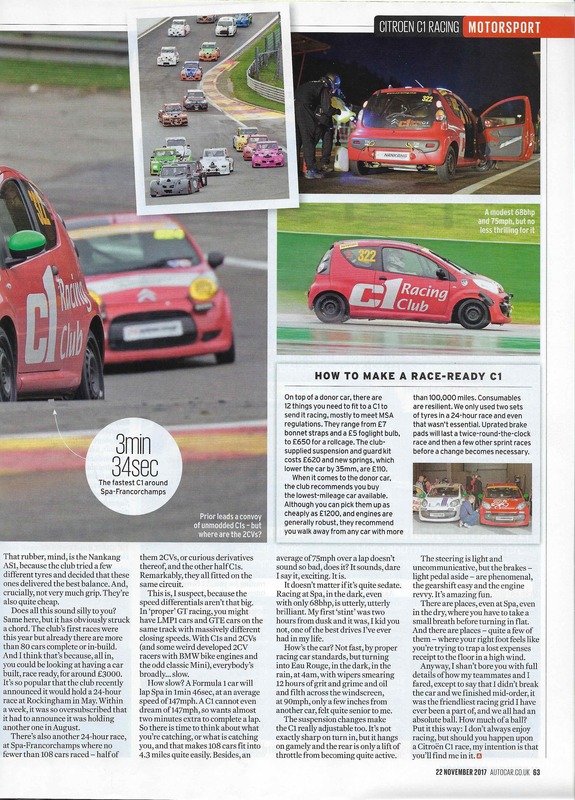 The C1 isn’t the most powerful car in the world, is it frustrating not having more power? 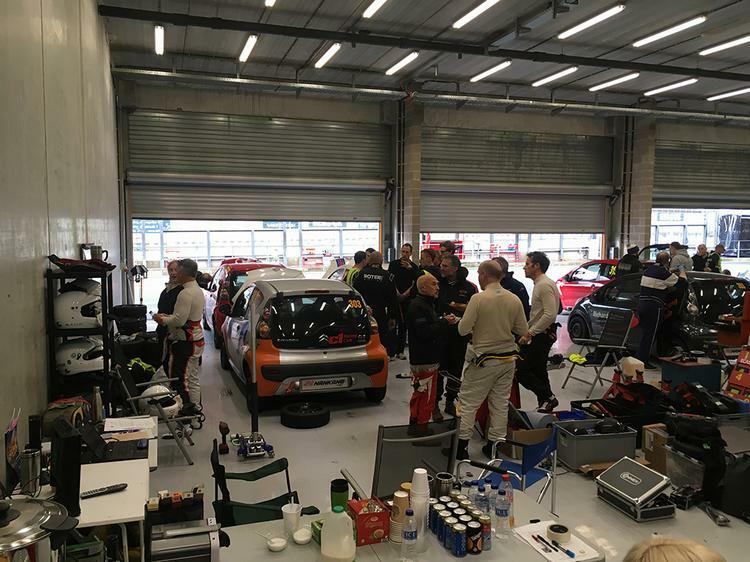 On a general track day, the power can be frustrating when you have Aston Martins out with you, but when it’s just the C1 racing it’s fine and the cars drive and handle great. 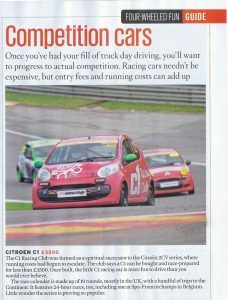 Have you done any other forms of racing, and how does C1 racing compare? As a family we have raced for over 15 years now. 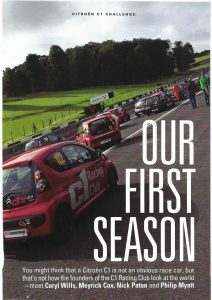 Myself personally, I’ve held my race licence for 3 years, I have raced in the Blue Oval Sports Saloon Championship and the Classic Touring Car Series. 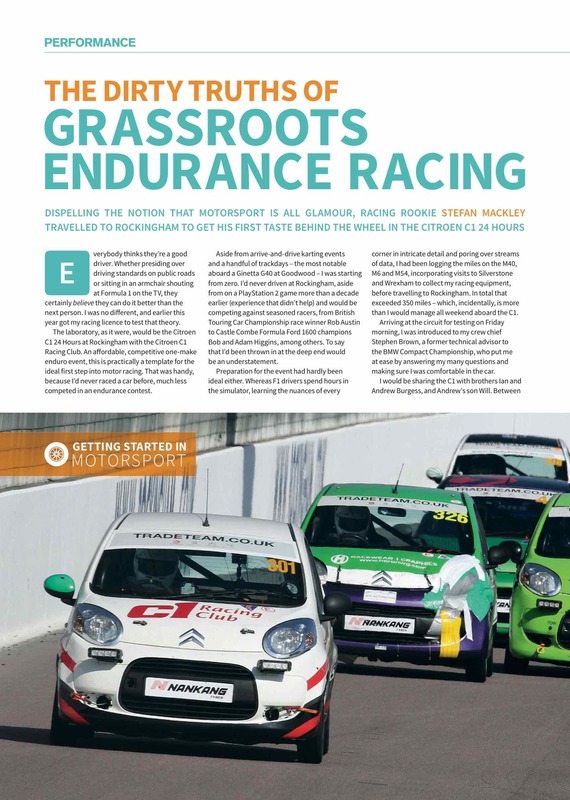 Our previous racing experiences were 15-minute sprint races so completely different to C1 endurance, as with sprint races you have to fight from lap 1 whereas in endurance racing you have to ‘finish first to finish first’. If you could race any car what would it be? I would love to try BTCC. As a tin-top racer, it’s the pinnacle of motorsport. 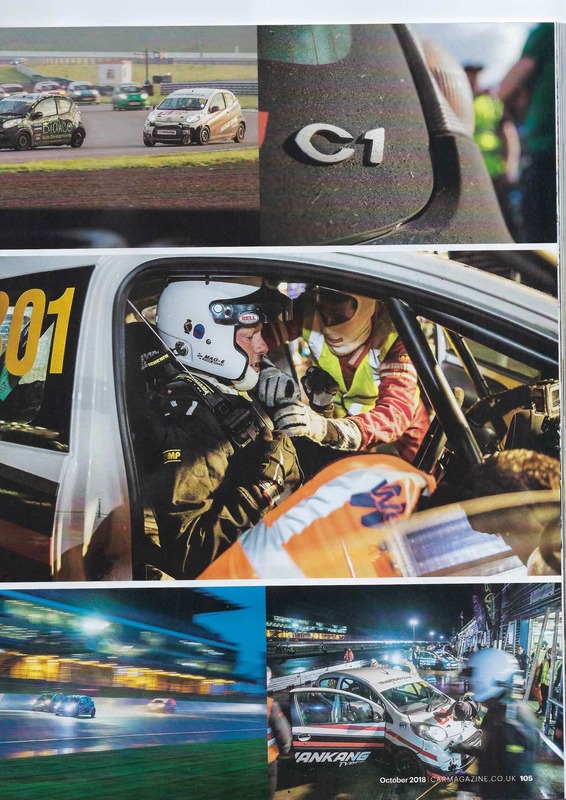 Favourite thing about C1 Racing? It has to be the great team spirit in the pit lane. With over 350 drivers at Rockingham this weekend it was like a huge family party, everyone willing to help everyone. Also, the cost is great! 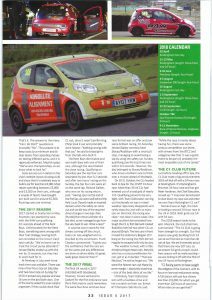 We plan to continue in C1s helping the club grow and we would like 5 cars out next year. Beyond that, we don’t know as we always need good sponsors to create the budgets. 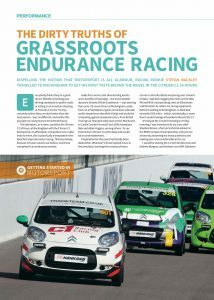 How have Quickco/QSP supported your C1 racing endeavours? QSP (Quality Sourced Parts) have been great. 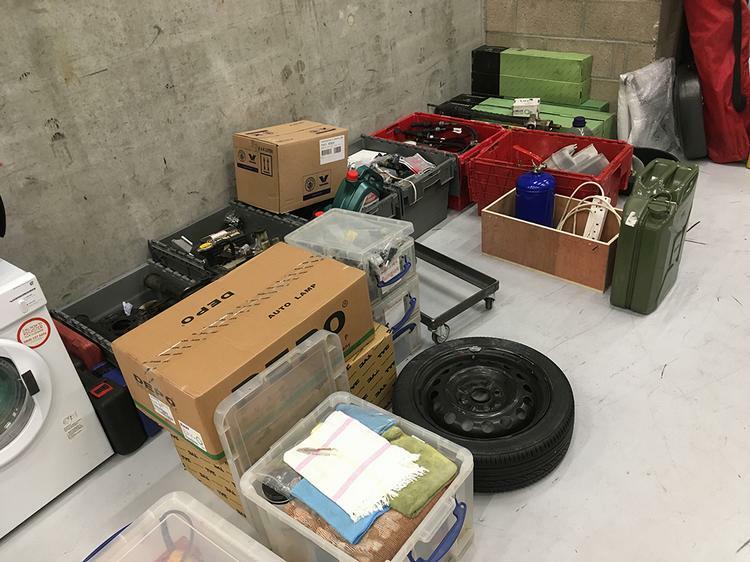 They have supplied us with all the initial parts required for 3 cars, from oil and filters to discs and pads they have been amazing and without their support we would not have been able to get out on track this year. 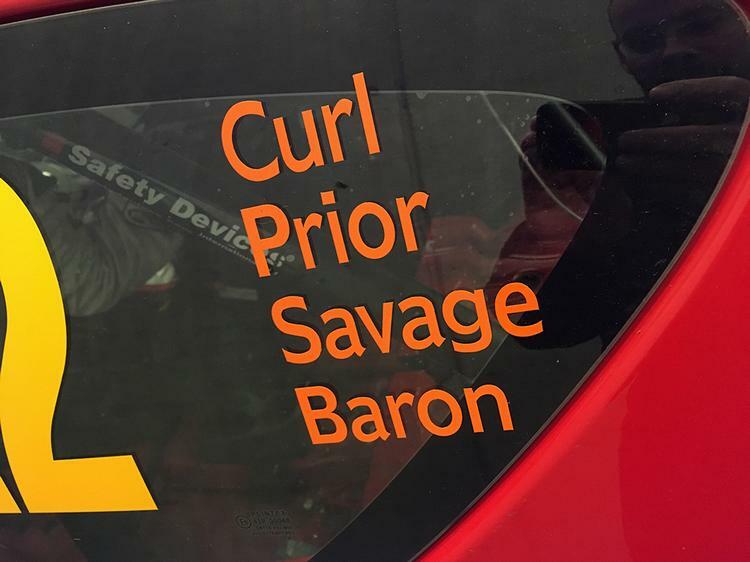 After an impressive P5 finish (as well as cars in P25 and P29) at Rockingham 3hr everyone at Evans Halshaw would like to wish Scott and the team best of luck for the rest of the season. Want to get involved? 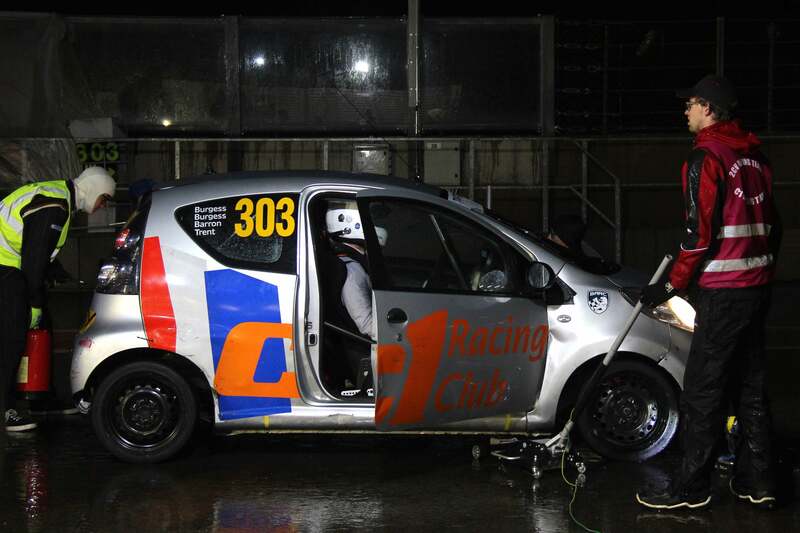 Check out the C1 Racing Club on Facebook. 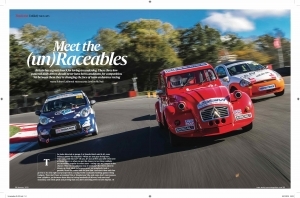 Night racing in the most unlikely car on the market Back in the day, Citroën 2CV racing series was tremendously popular, providing cheap, fun motorsport for the masses. 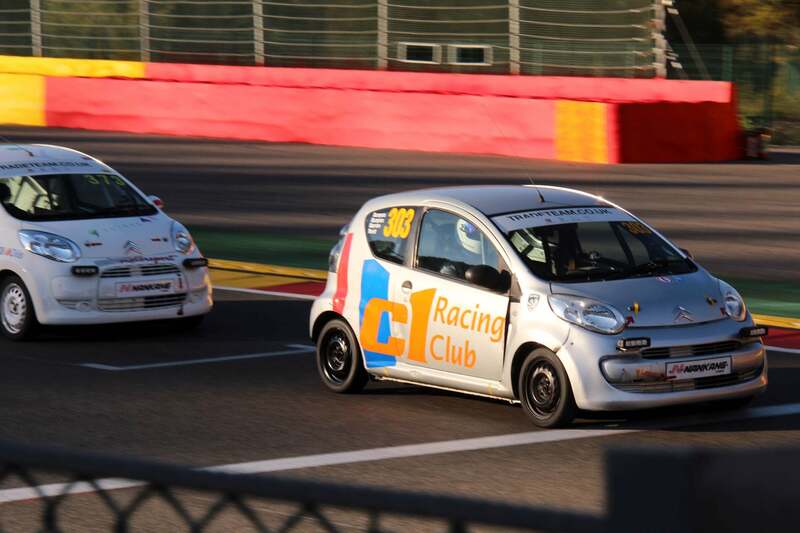 Now we have its successor – the Citroën C1 Racing Club, which caters for the French brand’s three-door city car. 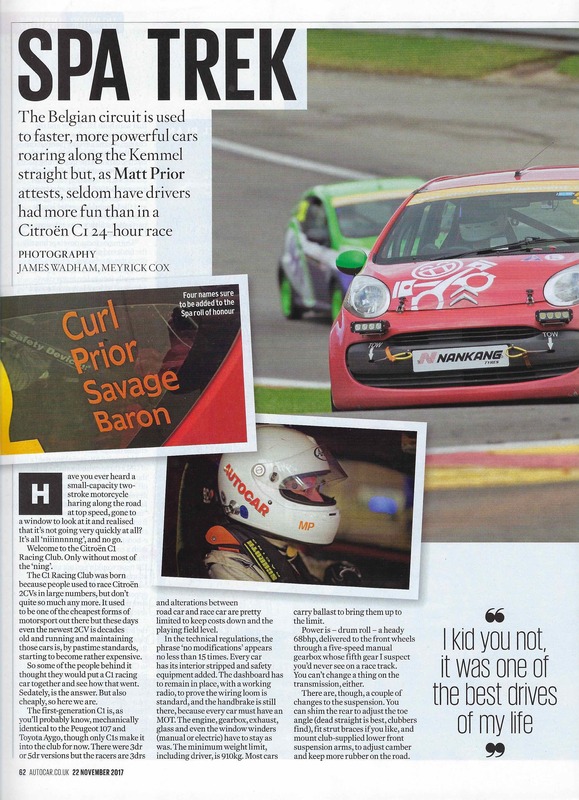 It doesn’t sound especially exciting, but here’s the thing; we sent a colleague to take part in a race at the legendary Spa Francorchamps circuit in Belgium, and he reported that it was one of the very best drives he’d had in 20 years of writing about cars. 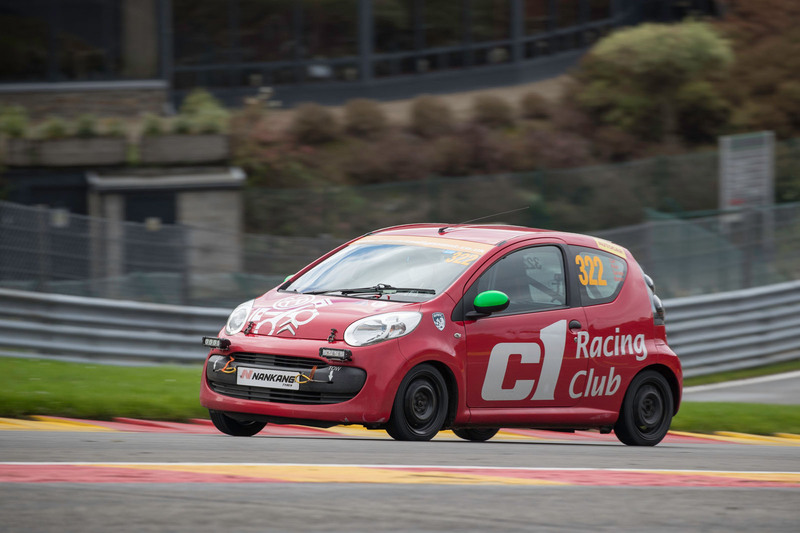 So, what does Citroën C1 racing entail? Well for a start, modifications are restricted. Most interior components still have to be present and correct, such as the dash, stereo and even the window winders. You can remove carpets and the like, however. Mechanically, the engine exhaust and intake must be factory spec, while the suspension set-up can be only moderately tuned. Essentially, you have 68bhp to play with, fed to the front wheels via the five-speed transmission. Wheelspin is unlikely to be an issue. He continued: “Besides, the suspension changes mean that there’s some chassis adjustability, too. The steering remains pretty uncommunicative, the brakes are superb, the gearshift light and the engine revvy. 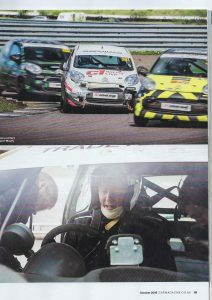 And even on a big, senior circuit, it’s great fun. 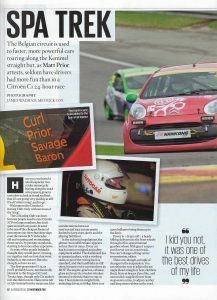 In places at Spa you have to take a deep breath before turning in flat, places where you have to brake heavily, and places where your foot is pressed so hard to the floor that you emerge from a stint with an aching right calf.” The diminutive C1 racer clearly punches well above its weight on a huge circuit such as Spa – just imagine what fun it will be on smaller tracks. Roll on Rockingham 2018. 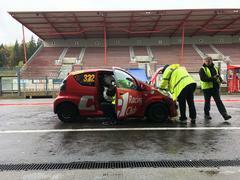 Matt Prior reports on his time in car 322 at Spa on PistonHeads website here. Driving coach Rob Wilson talks about racing “becoming a craft” when you get good at it. Once you understand the physics of driving, what will make a car fast and what won’t, you can work on this craft, patiently, to go quicker.Which is fine if, like Wilson, you’re a driver who’s competed in Nascar, at Le Mans or around Daytona, or you’re one of the drivers – up to and including those in F1 – who have called on his training. What happens in microseconds can become a craft if you’re equipped to deal with it. And if you’re not quite up to speed? Welcome to the Citroen C1 Racing Club. 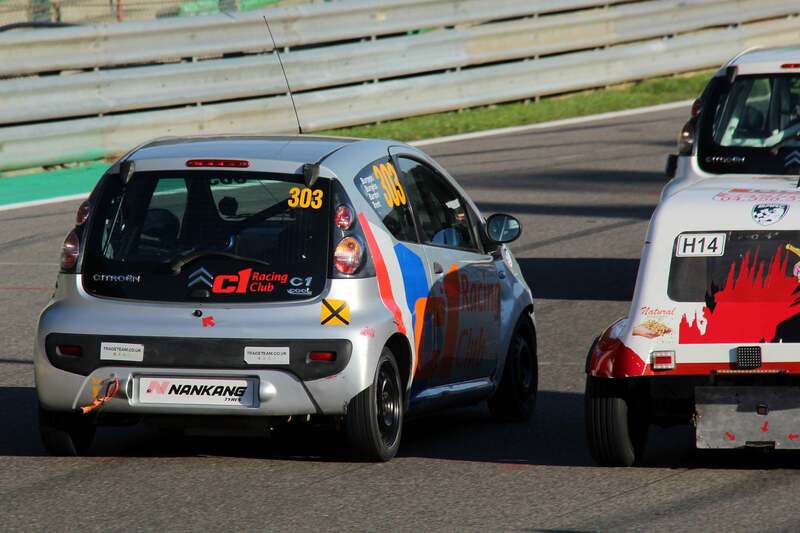 The C1 Racing Club was born, if not out of frustration with, then as a result of, the modern limitations of Citroen 2CV racing. 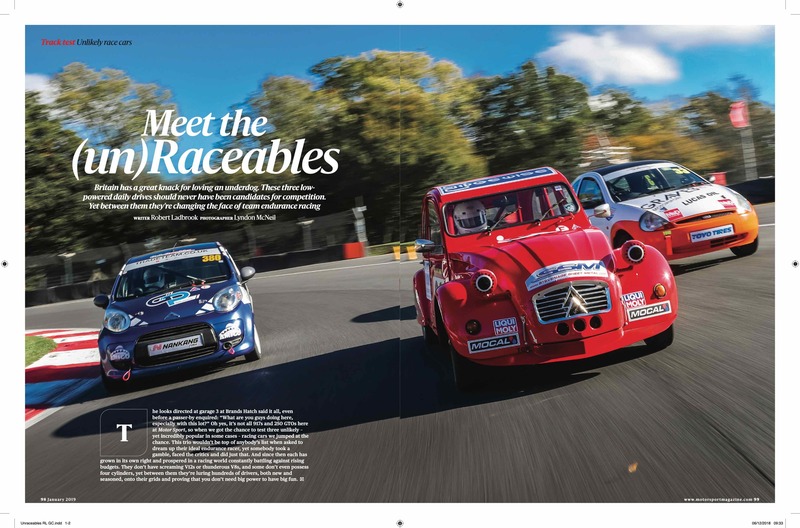 It used to be one of the cheapest forms of motorsport around but even the newest 2CV is decades old these days, and running and maintaining a race example is getting – by hobby standards, if not by those of motor racing – expensive. So a few devotees decided they’d put a C1 together instead and see how it went as a racing car. Slowly, was the answer. But cheaply. So here we are. You’ll know the C1. Or you’ll have seen it. Mechanically identical to the Peugoet 107 and Toyota Aygo (though the club only allows Citroens in for now), it’s a city car, built from 2005 onwards, which could be had with three or five doors. 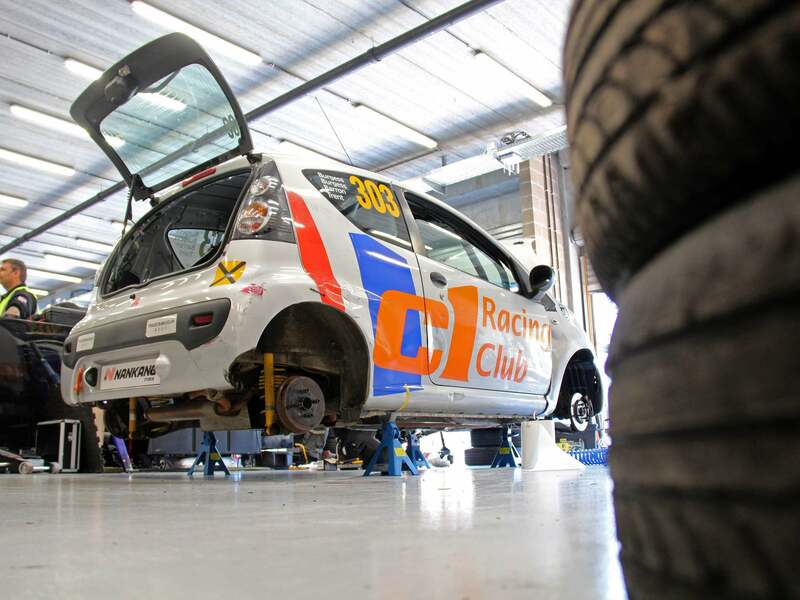 The Club uses the 3dr version and alterations to turn it into a bona fide race car are limited. The phrase “no modifications” features in the standard regulations no less than 15 times. Sure, every car can be stripped of its interior trim and carpets, but mostly only so that safety equipment can be fitted. The dashboard, including a working radio and handbrake, must be retained. The wiring loom, engine, exhaust, gearbox, glass and even window winders have to be as standard, and each car must be MOT’d. There’s a minimum driver-aboard weight limit of 910kg, which most drivers will add ballast to get up to. Power, wait for it – and you’ll have to – is 68hp, delivered to the front wheels via a five-speed gearbox, the fifth gear of which you’ll probably never need on a race track. No, you can’t modify the engine. No, you can’t mod the intake. No, you can’t remove the catalyst. 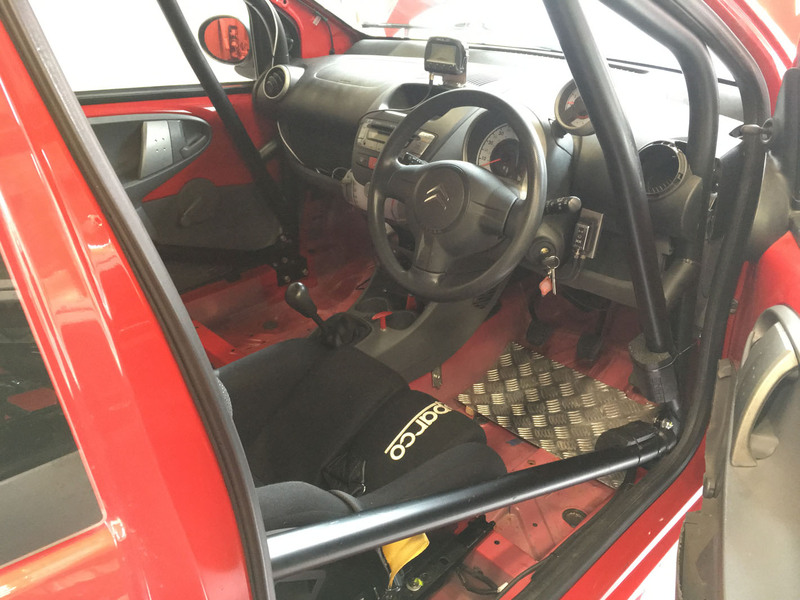 What you can – and will – do, is make a few changes to the suspension, shimming the rear to adjust toe angle, fitting strut braces if you like, and adding a club-supplied lower front wishbone, which puts more rubber to the road; although again, the terms are relative. Does it all sound suitably daft? It might, but the idea has struck an uncanny chord. 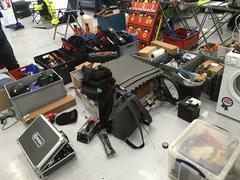 The Club had its first races this year, and already there are more than 80 cars completed or in-build. Because, all-in, you could be looking at having a fully-prepped racing car for under £3,000. 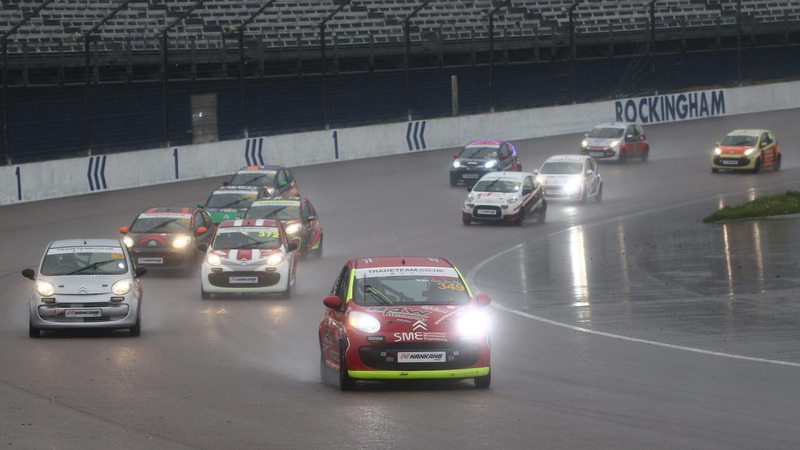 The Club recently announced a 24-hour race at Rockingham next May. 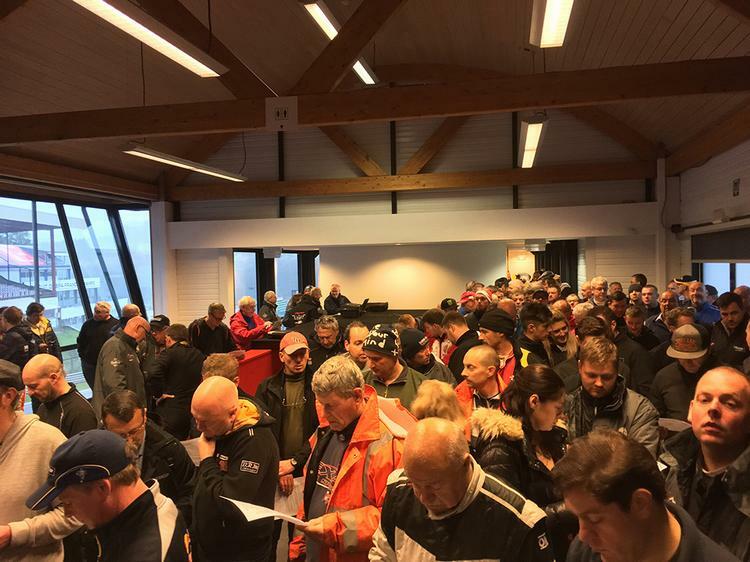 A week later, the grid was full, after 70 cars had signed up. 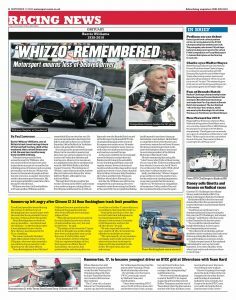 Sounds like a lot, does it not, 70 cars around Rockingham? It probably is, but then, it is manageable. 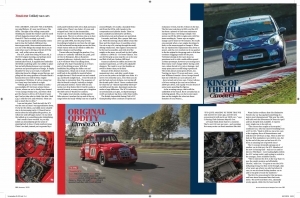 And I know this because last week I climbed into a racing C1 at Spa Francorchamps, alongside 107 other cars – around half of them 2CVs or curious derivatives thereof, another half or so C1s, and a couple of old Minis – and we all fitted. For 24 hours. This remarkable feat is, I suspect, because the speed differentials are not that huge. 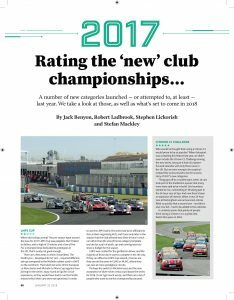 Unlike classic endurance racing, where an LMP1 car may well be on circuit with GTE cars, or Britcar where a Ferrari F430 might be on track with a Volkswagen Beetle, the C1 and its ilk are all similarly, well, how to put it … slow. An F1 car will lap Spa in around 1m 46s, at an average speed of 147mph. A C1 can only dream of 147mph, and wants almost two minutes more to complete a lap. An average of 75mph, then, would have a C1 writing postcards home. So there is time to think about what you’re catching, or what is catching you, and that makes 108 cars fit into 4.3 miles quite easily. 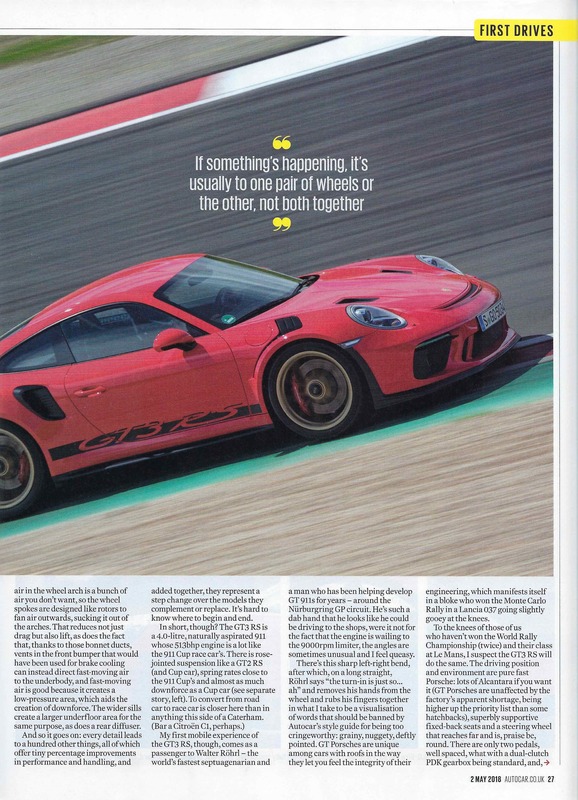 And, now I read it again, an average of 75mph over a lap doesn’t sound so bad, does it? It sounds, dare I say it, exciting. Dear reader, it is. 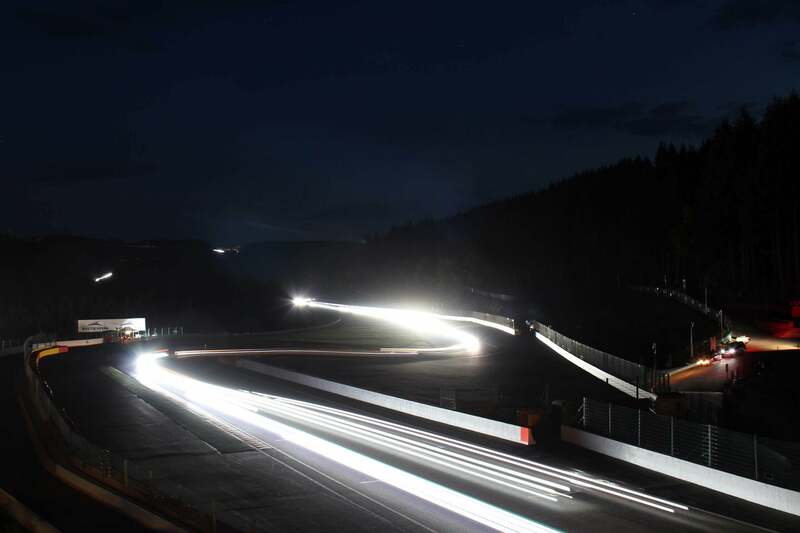 It doesn’t matter how thrilling a road car is, racing at Spa in the dark, even with 68hp, is absolutely brilliant. 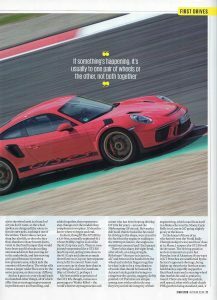 At one point I was talking to two blokes, who between them have three Porsche Carrera GTs, and they thought it was pretty exciting too. I drove for two hours from dusk and it was – and I kid you not, here – one of the very best drives I’ve ever had in 20 years of writing about cars. What is the car like? 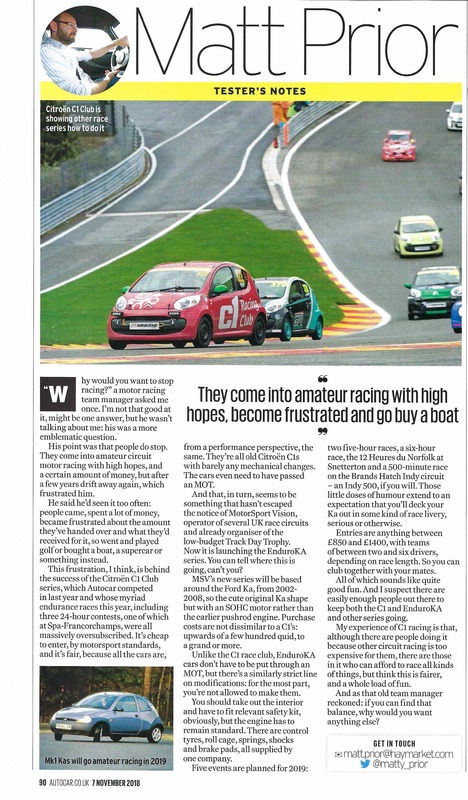 It may not be very quick, but turning in to Eau Rouge at 90mph in the dark and the rain, with wipers smearing water relatively ineffectively across windscreen oil and filth, only a few inches from another car, it all felt real enough to me. Besides, the suspension changes mean that there’s some chassis adjustability to the C1, too. The steering remains pretty uncommunicative, the brakes are superb, the gearshift light and the engine revvy. And even on a big, senior circuit, it’s great fun. 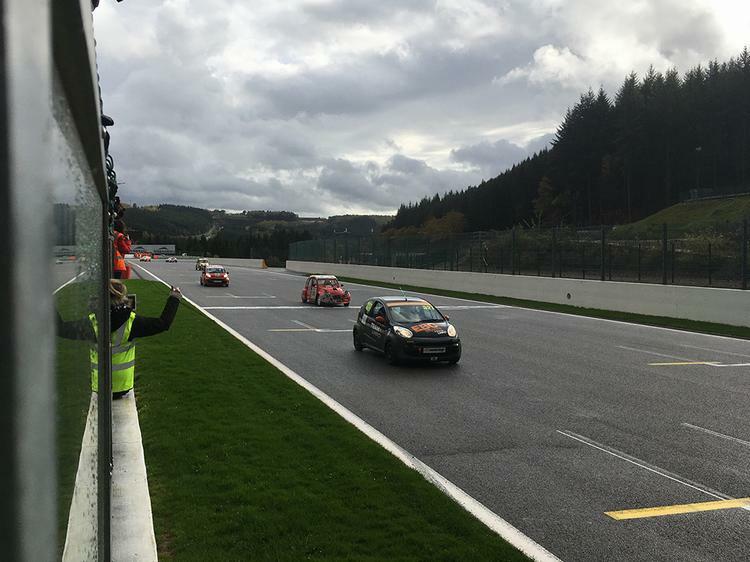 There are places at Spa where you have to take a deep breath before turning in flat, places where you have to brake heavily, and places where – obviously – your foot is pressed so hard to the floor that you emerge from a stint with an aching right calf. I shan’t bore you with how I got on, suffice it to say we finished mid-class and I didn’t put a dent on it, which I always count as a decent day’s work. But two things stand out for me: one, is that Rob Wilson was right, and that driving is a craft – you have a lot of time to consider how right or otherwise you’re getting it behind the wheel of a C1. The other is just how much fun this unlikely racing car is, to the extent that my old VW Baja Beetle will shortly be for sale, and that I intend to find myself part of a very large C1 racing grid next year.